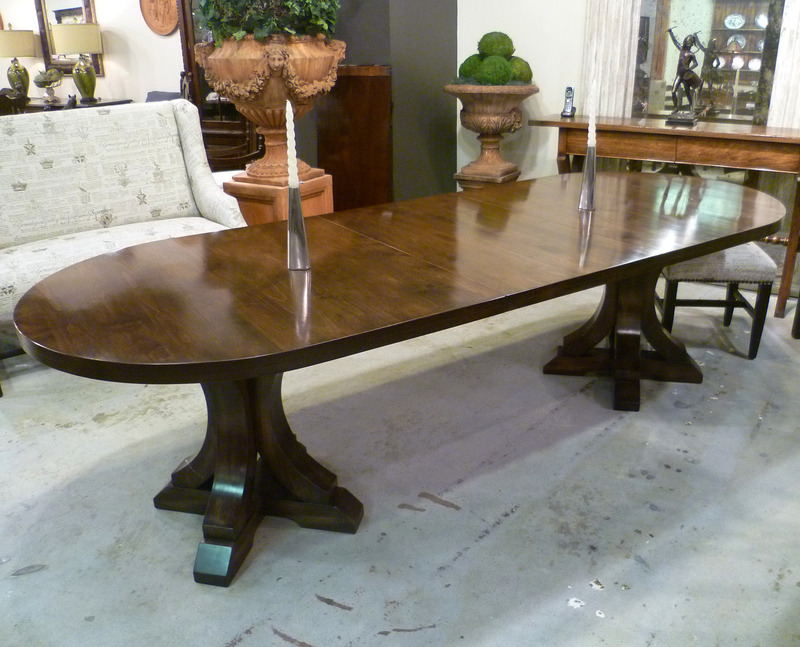 Englishman's specializes in classic and contemporary tables, from country kitchens to formal dining rooms. 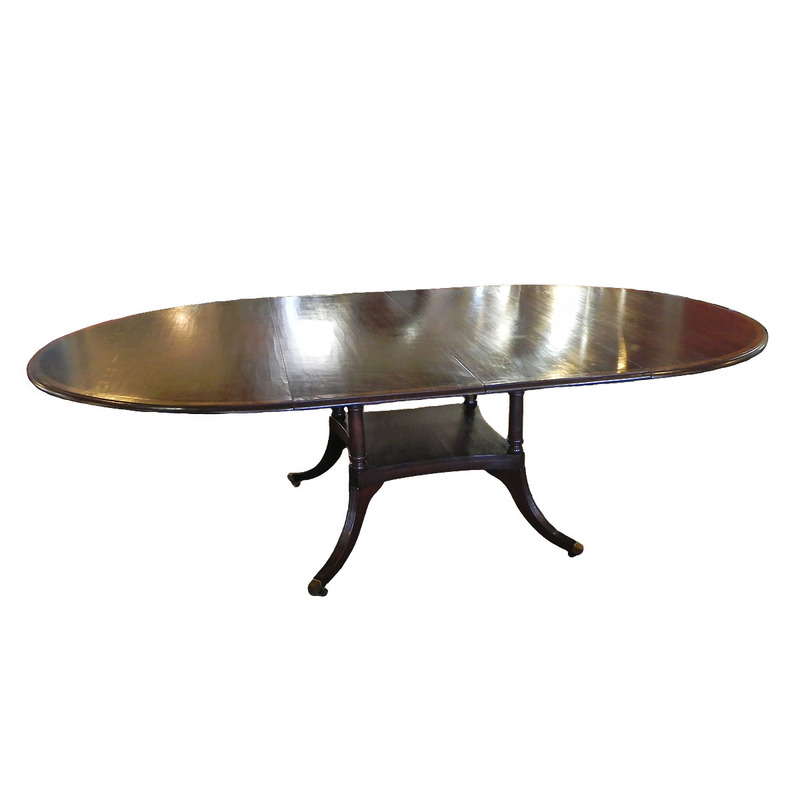 We offer tables in variety of sizes & styles including round, extending & rectangular tables. 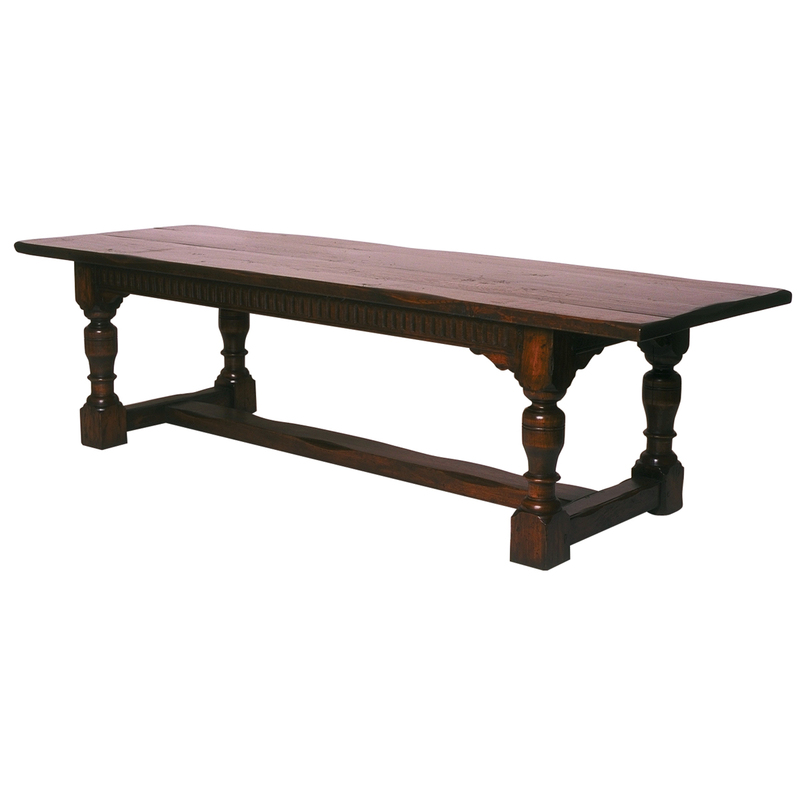 If you can not find a table you are looking for then let us hand-build you the table of your dreams. 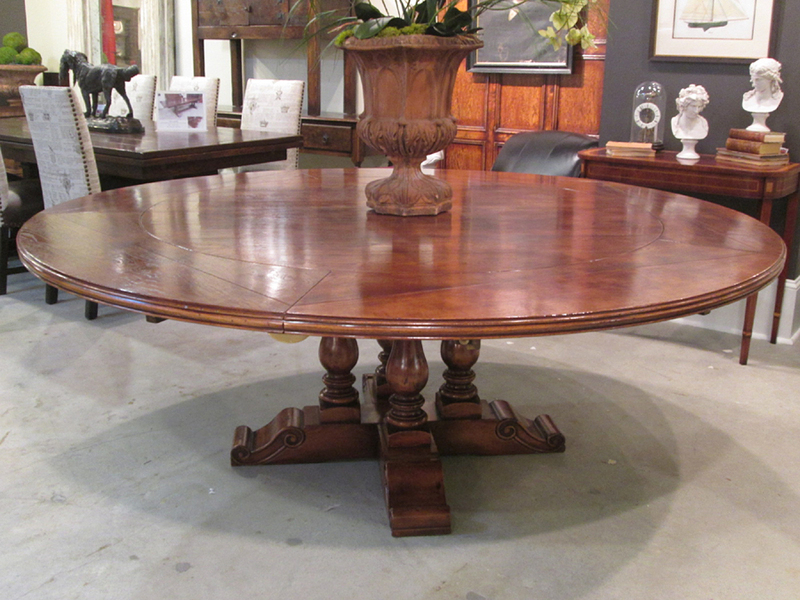 Antique cherry finish 6' round fleur de lis thick top 4 baluster pedestal base table with scroll feet. 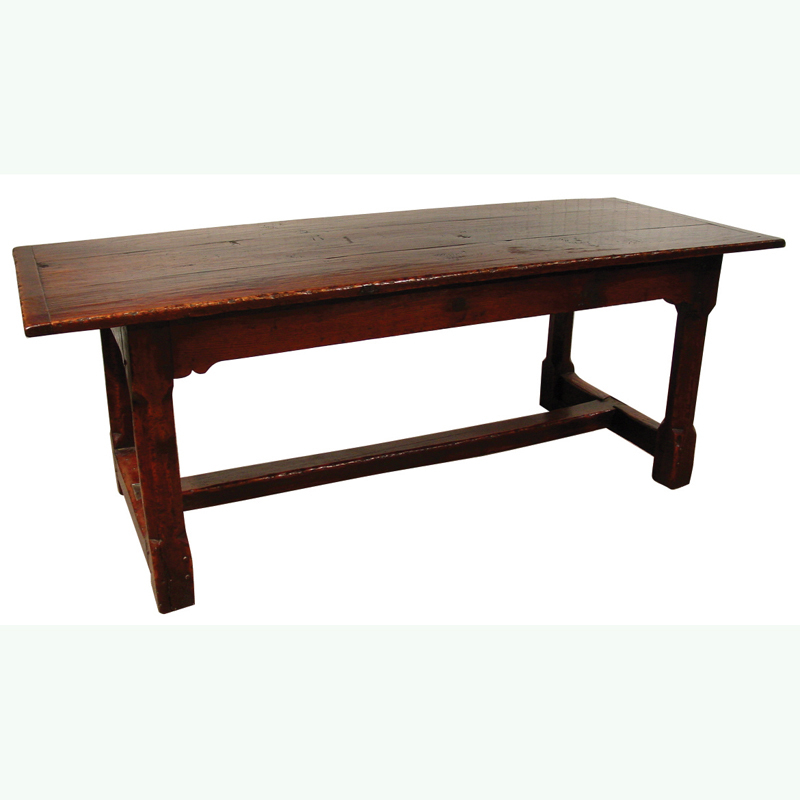 This table is hand made in England by skilled craftsman. 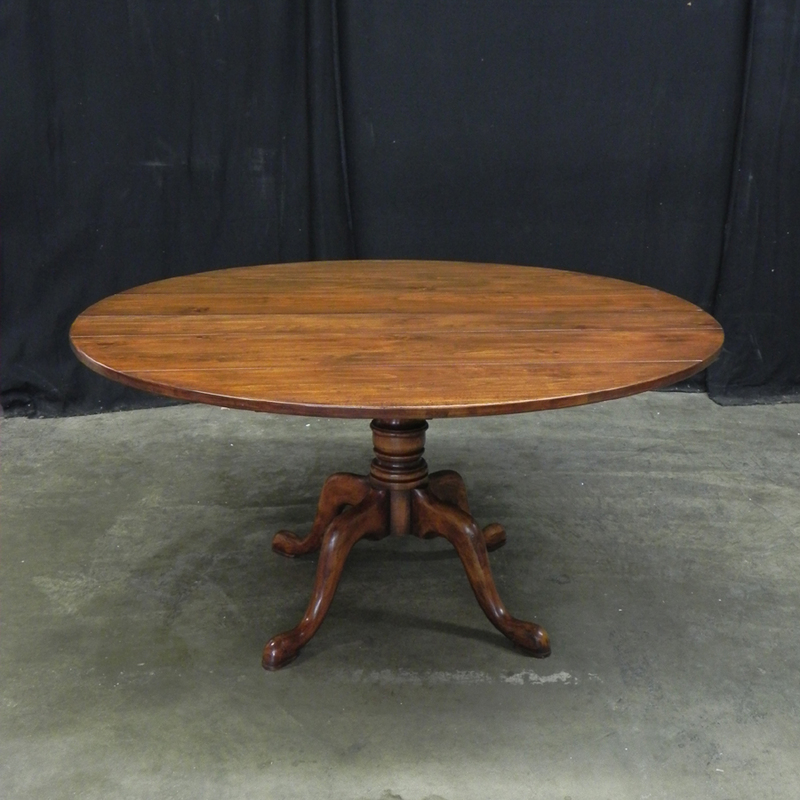 Antique cherry finish 6' round thick top 4 baluster pedestal base table with scroll feet. 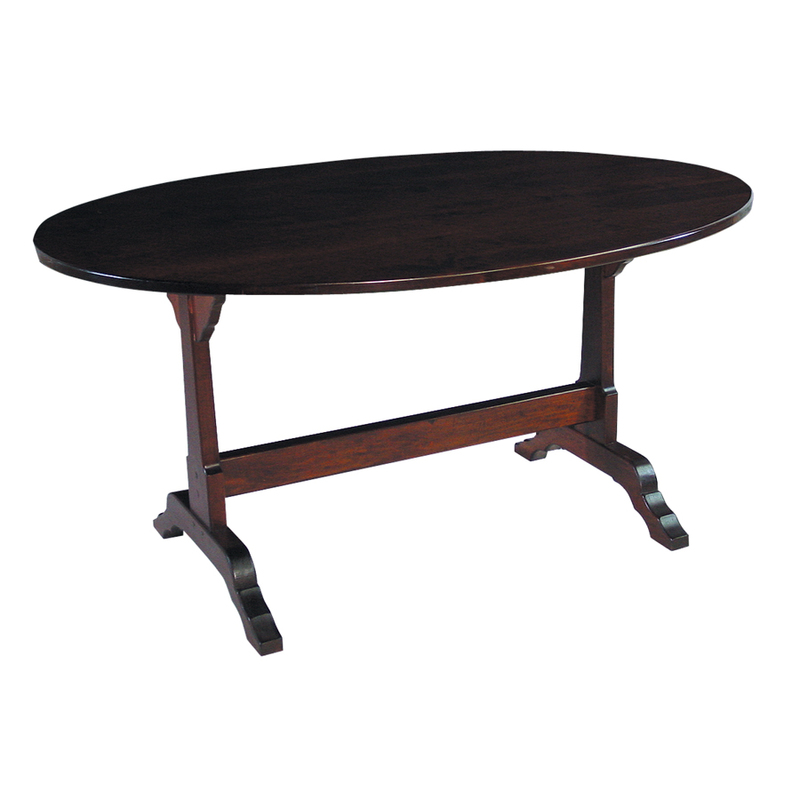 This table is hand made in England by skilled craftsman. 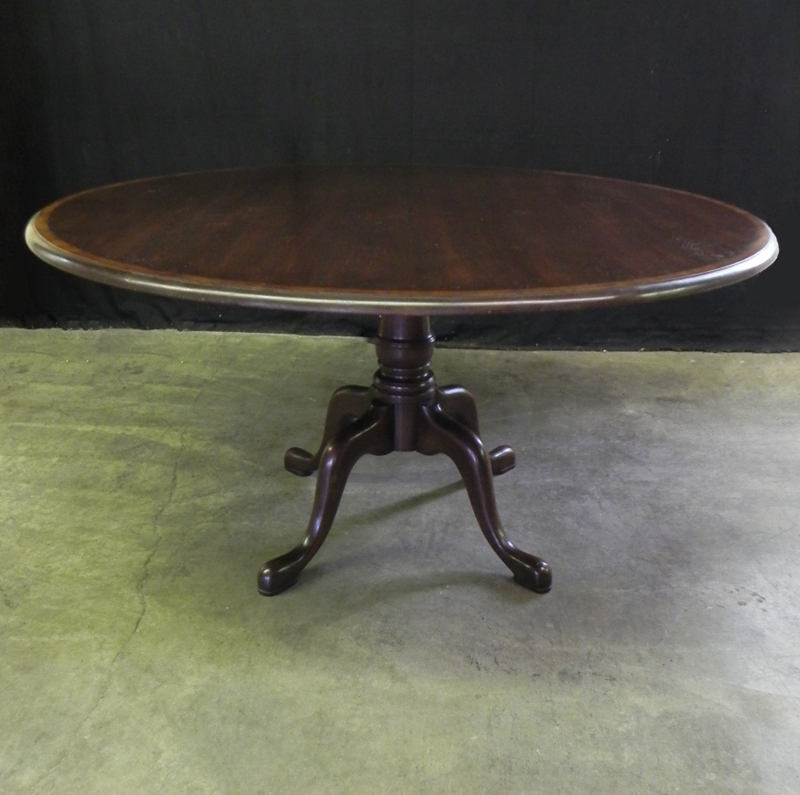 Antique cherry finish, 60" round extending spoon foot pedestal table with two 18" leaves. 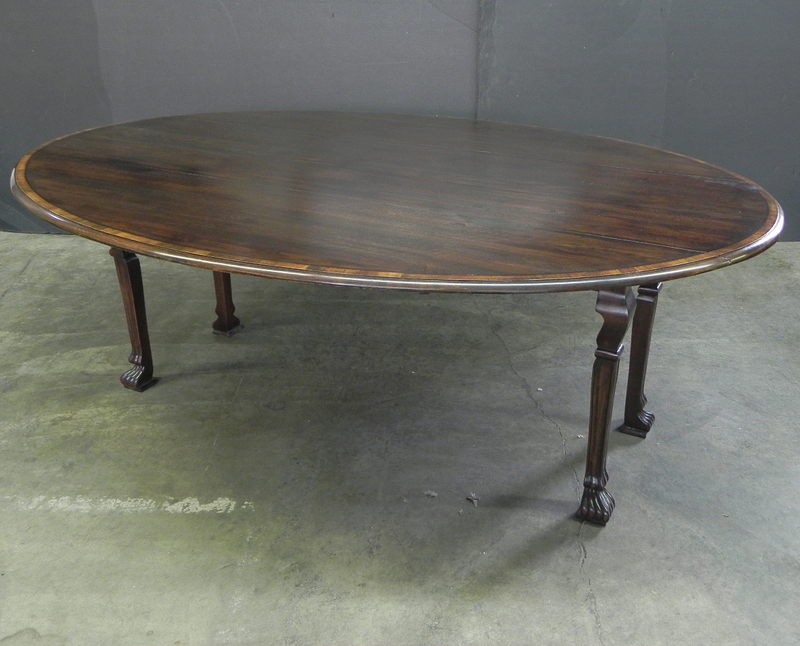 Antique cherry finish 60" round thick top 4 baluster base extending table with two 20" leaves. 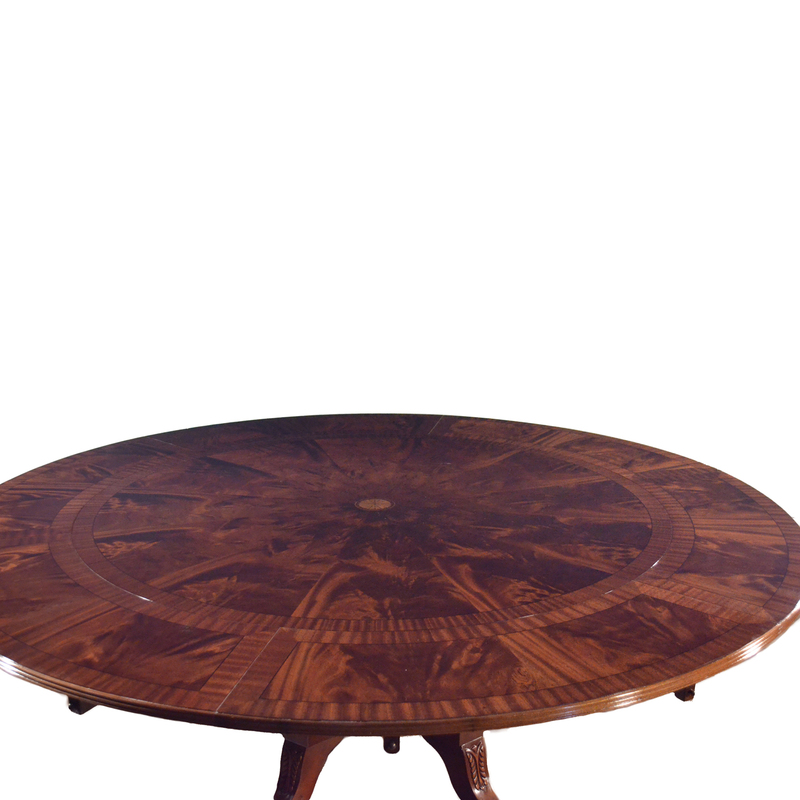 Table measures 60" Diameter when closed. 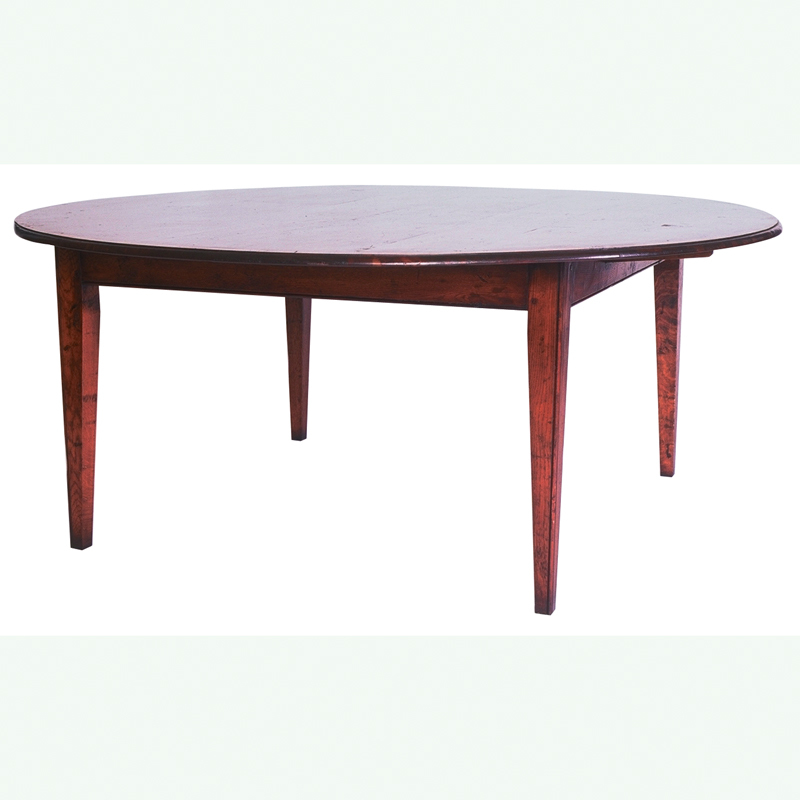 This table is hand made in England by skilled craftsman. 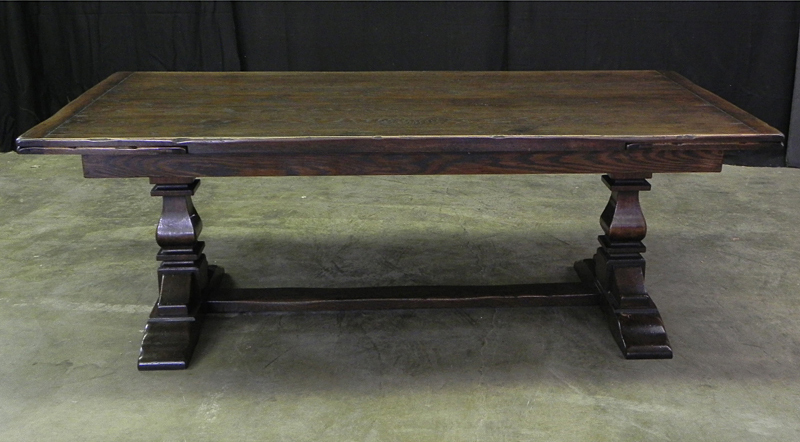 Antique cherry finish fleur de lis twin baluster trestle base refectory table with scroll feet. 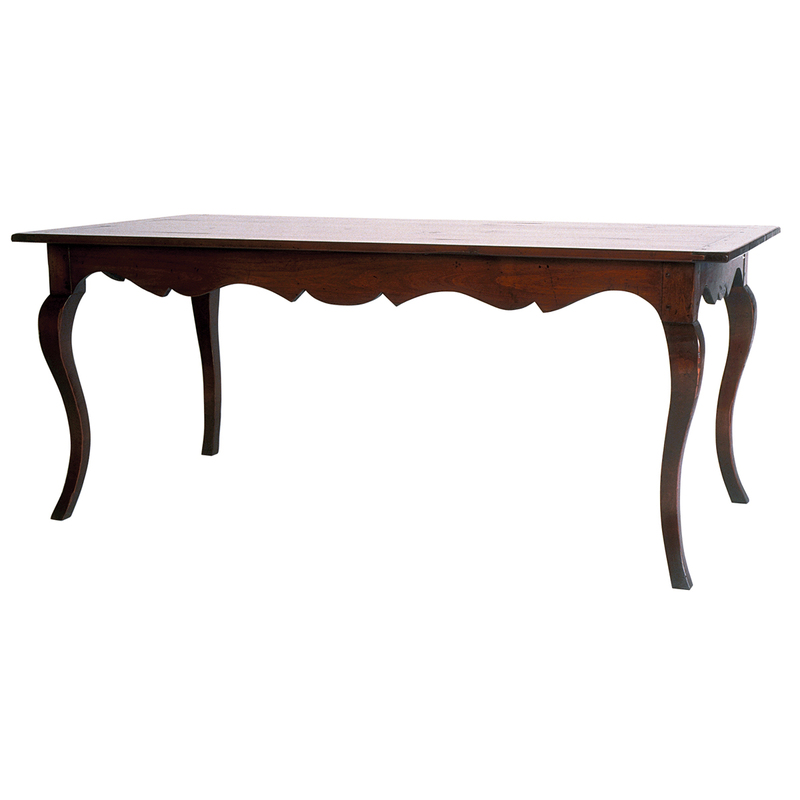 The table top features 4 fleur de lis motifs, one in each corner. 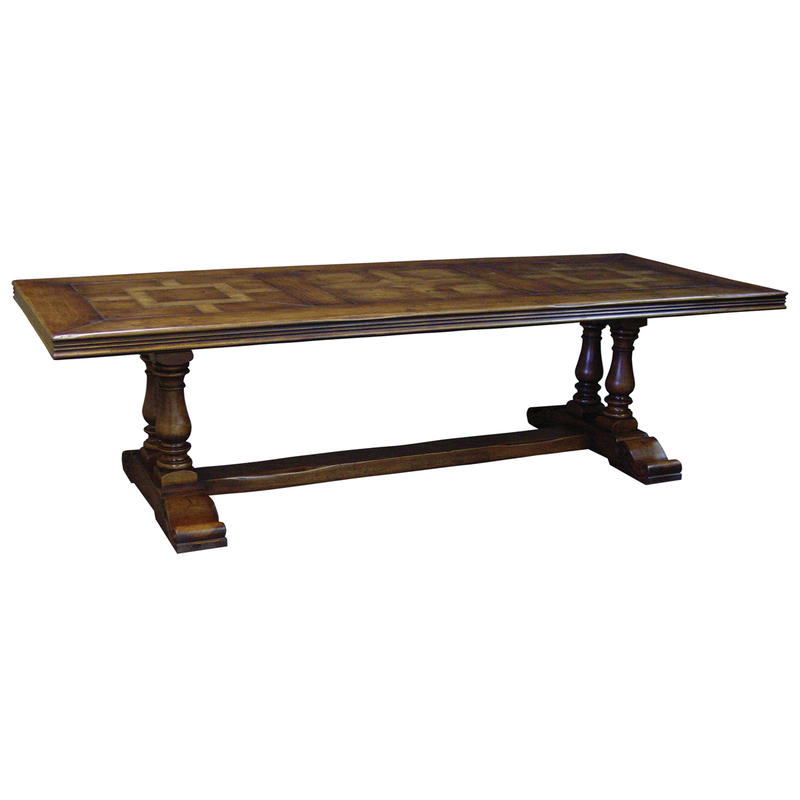 This table would be a lovely addition to your home and a true focal point, hand crafted in England. 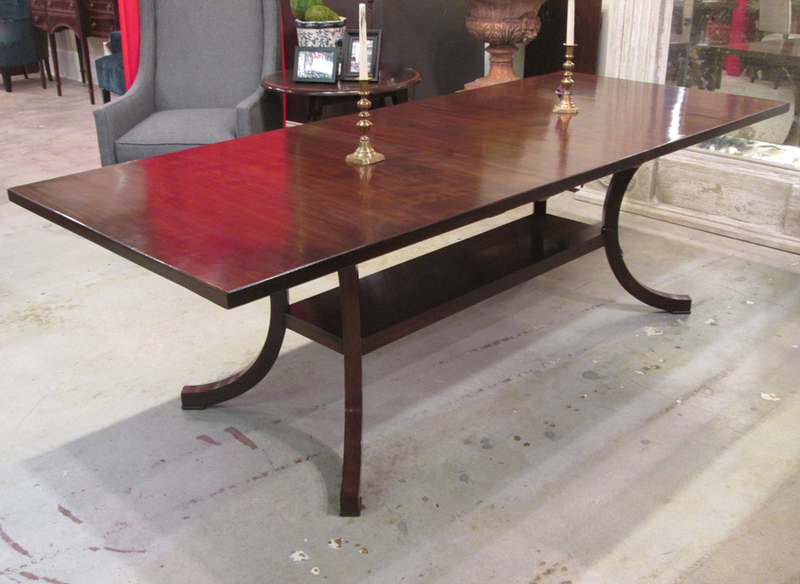 Antique cherry finish, cross banded 96" X 66" val tapered leg table. 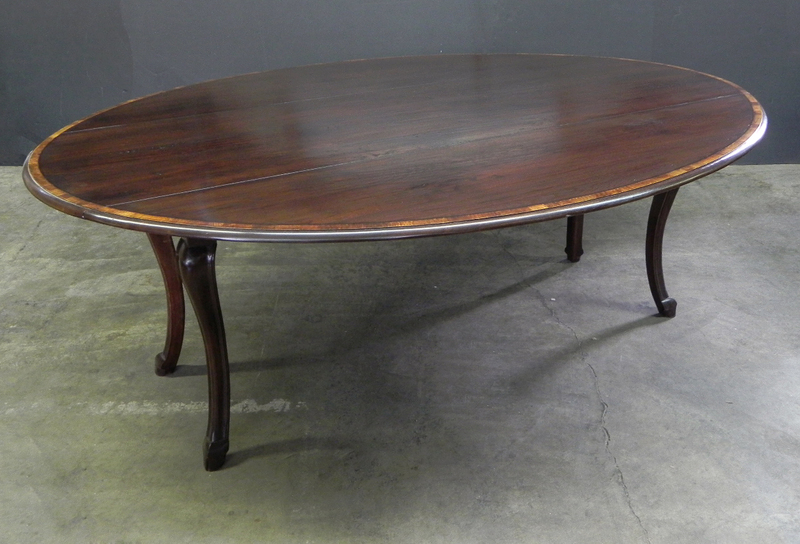 Antique cherry finish, yew wood banded oval wavy stretcher base extending table with two 18" leaves. 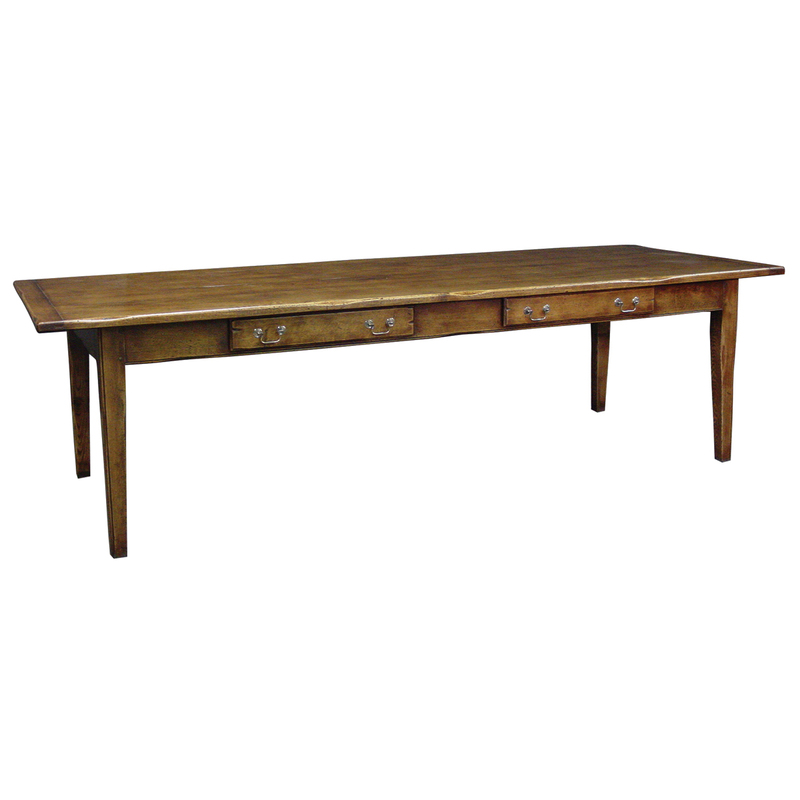 Also available with a fixed top, size W:84" D:66" H:30", style BT305. 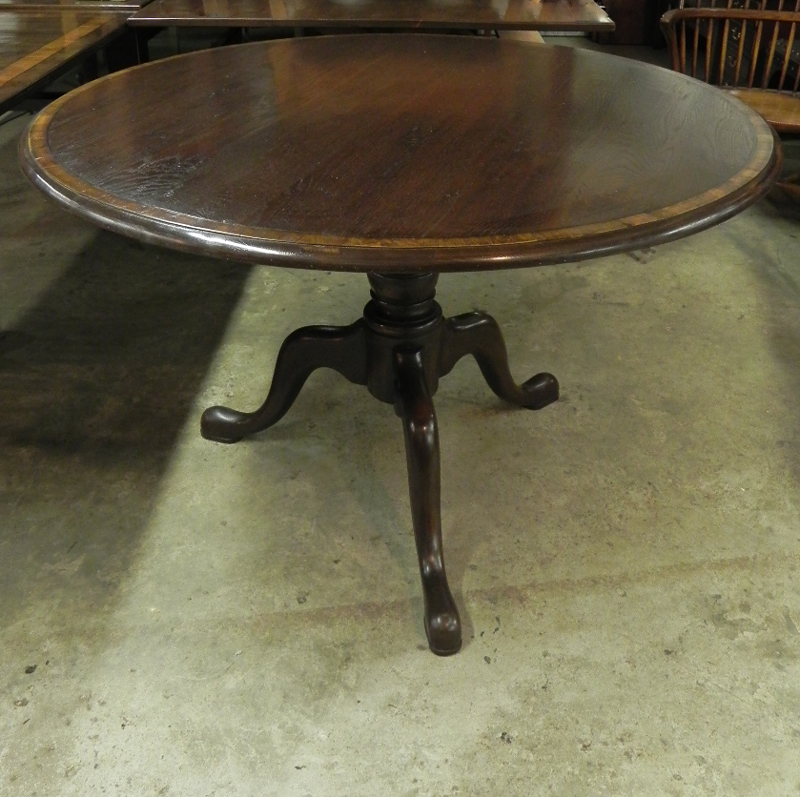 Antique oak finish, yew wood banded bulbous pedestal base table with scroll feet. 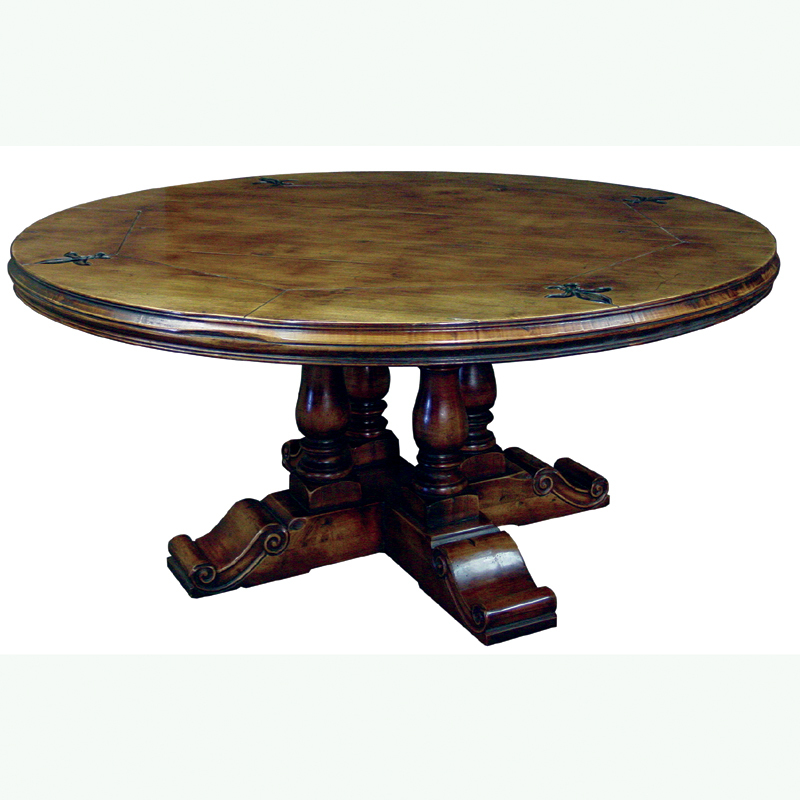 This table is hand made in England by skilled craftsman. 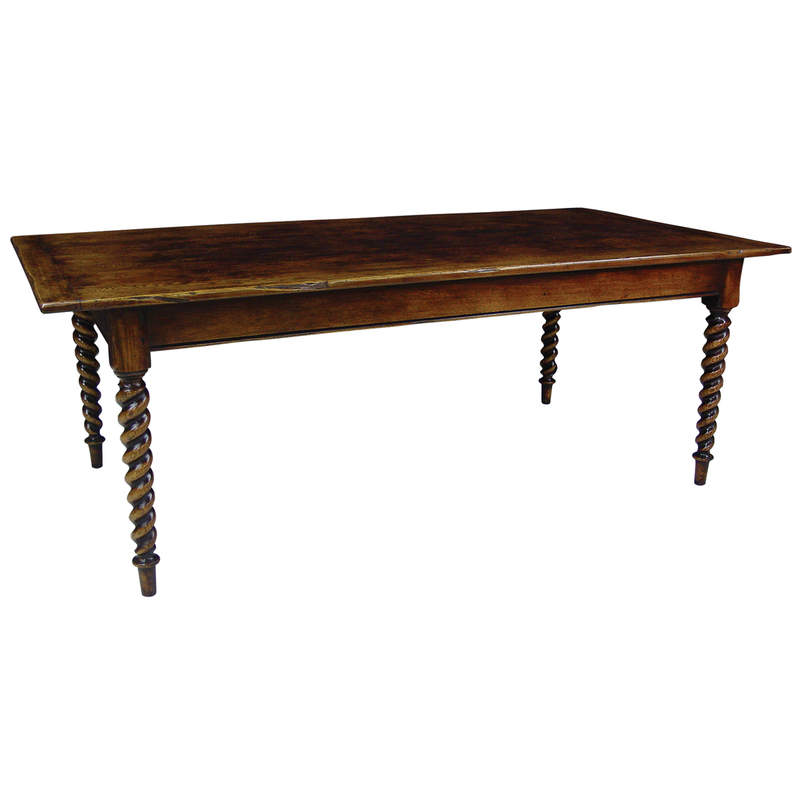 Medium oak finish, cross banded barley twist drop leaf table. 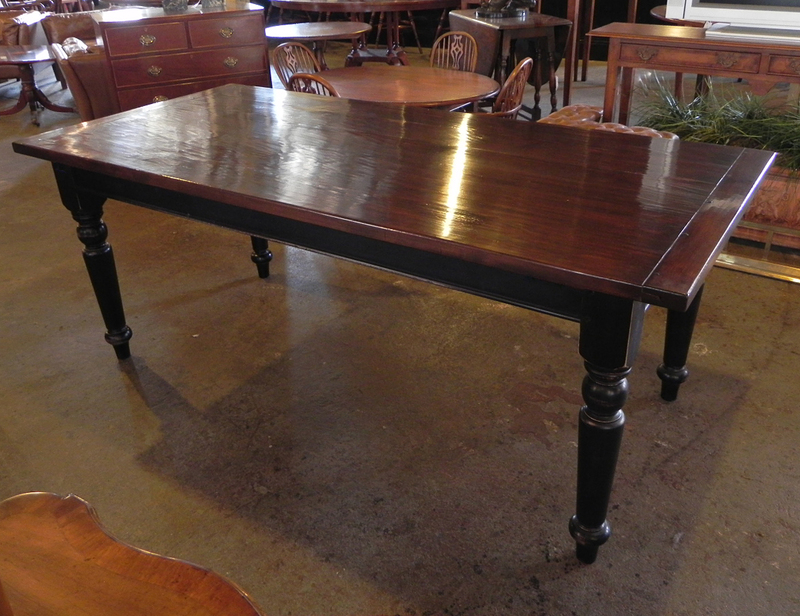 Black painted & rubbed chamfered leg drawer leaf table with medium oak finish top & two 18" leaves. 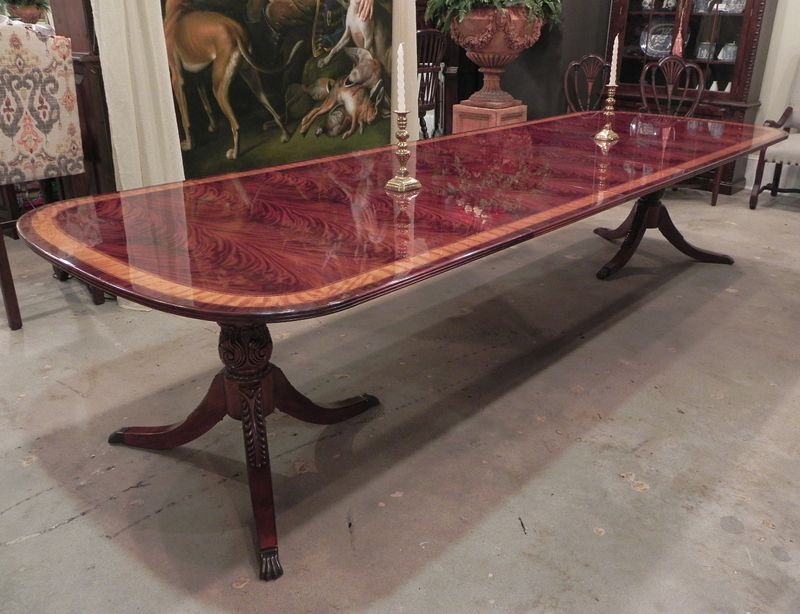 Mid cherry finish, cross banded French leg drop leaf table. 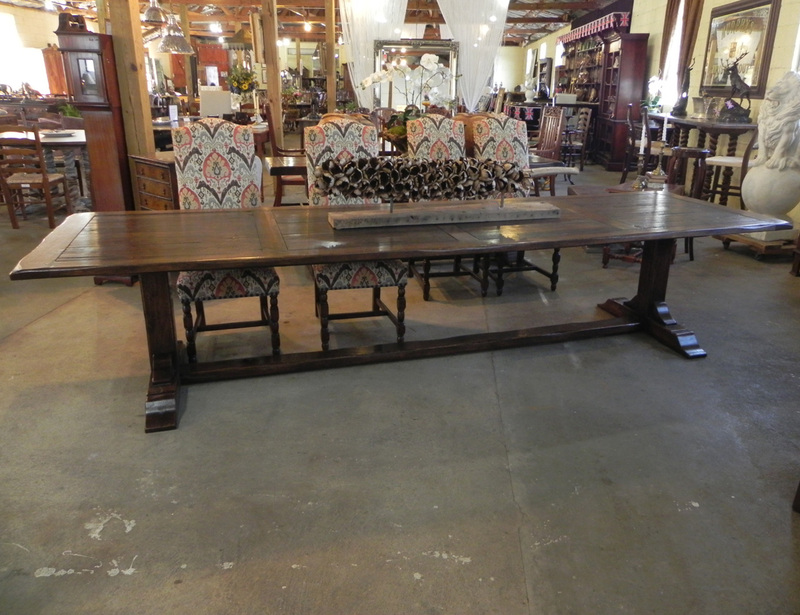 Also available in size: W:84" D:60". Also available with a pad foot. 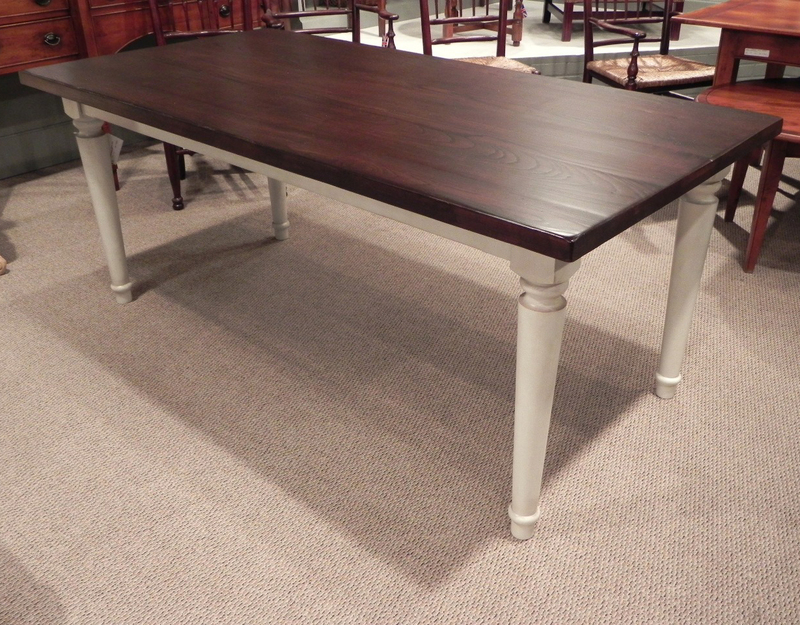 Mid cherry finish 6' X 3' plank top French leg kitchen table with bread board ends & scalloped apron. 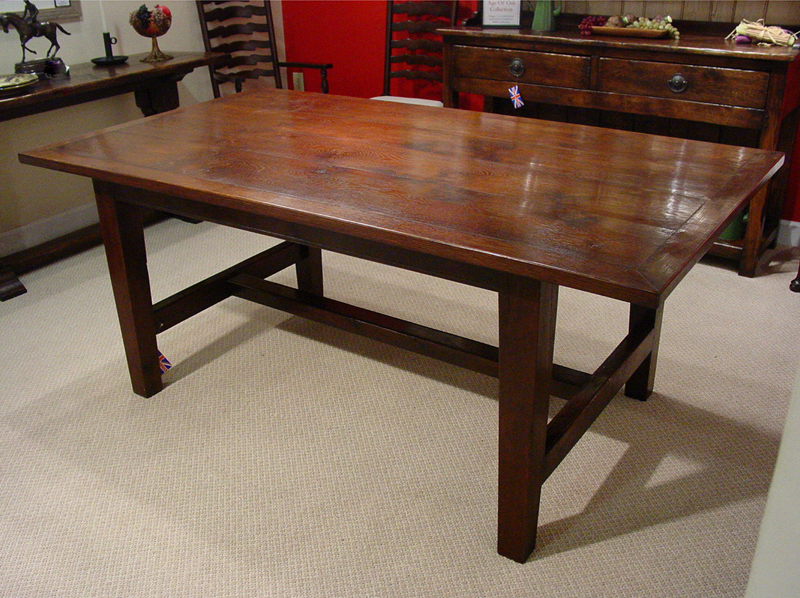 This table is hand made in England by skilled craftsman. 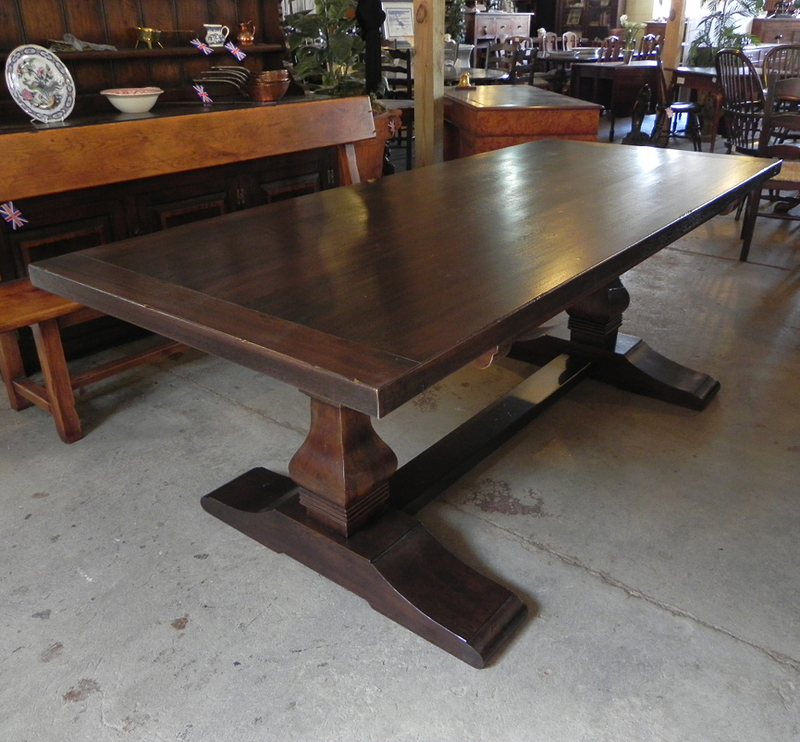 Mid cherry finish 7' X 3'-6" plank top kitchen table with breadboard ends & scalloped apron. 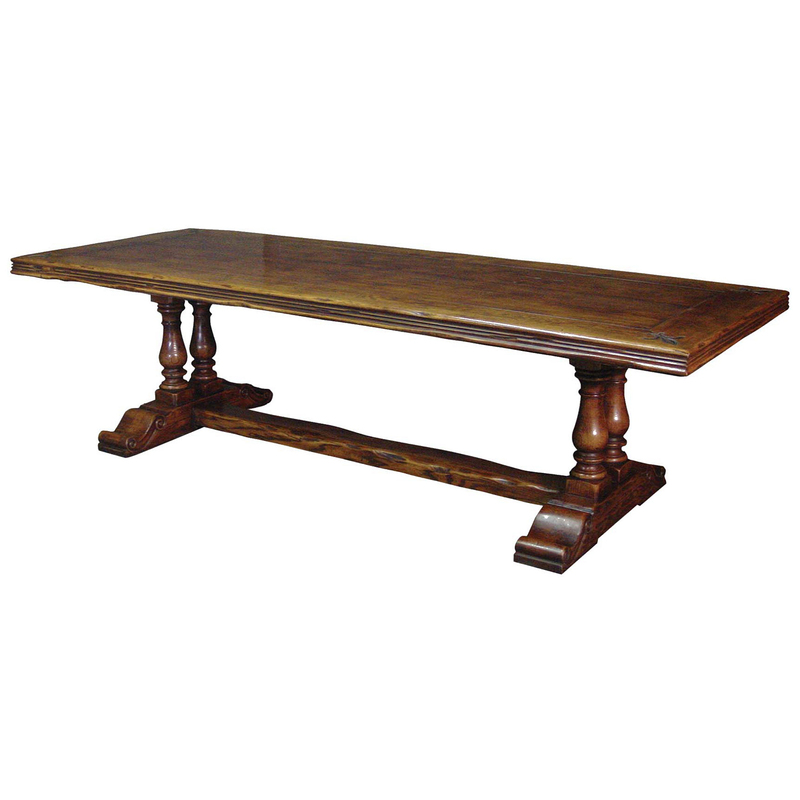 This table is hand made in England by skilled craftsman. 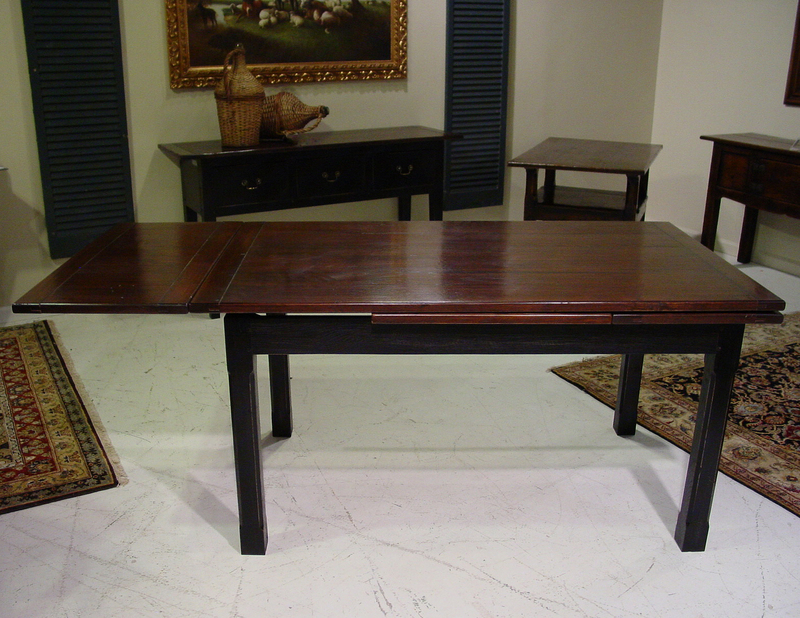 French cherry finish French style farmhouse table with 2 drawers. 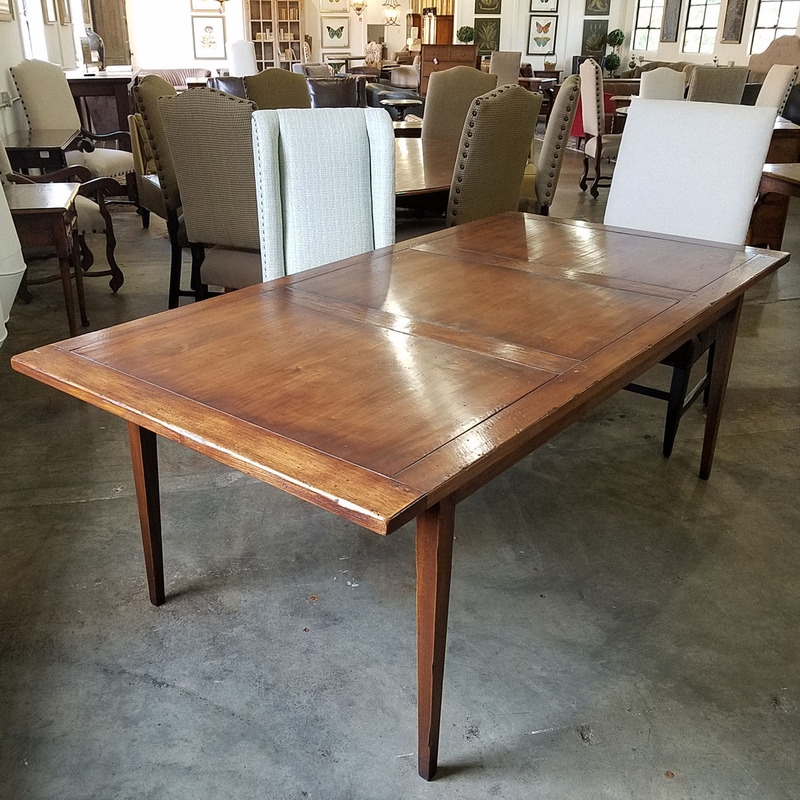 Medium oak finish, cross banded Georgian leg drop leaf table. 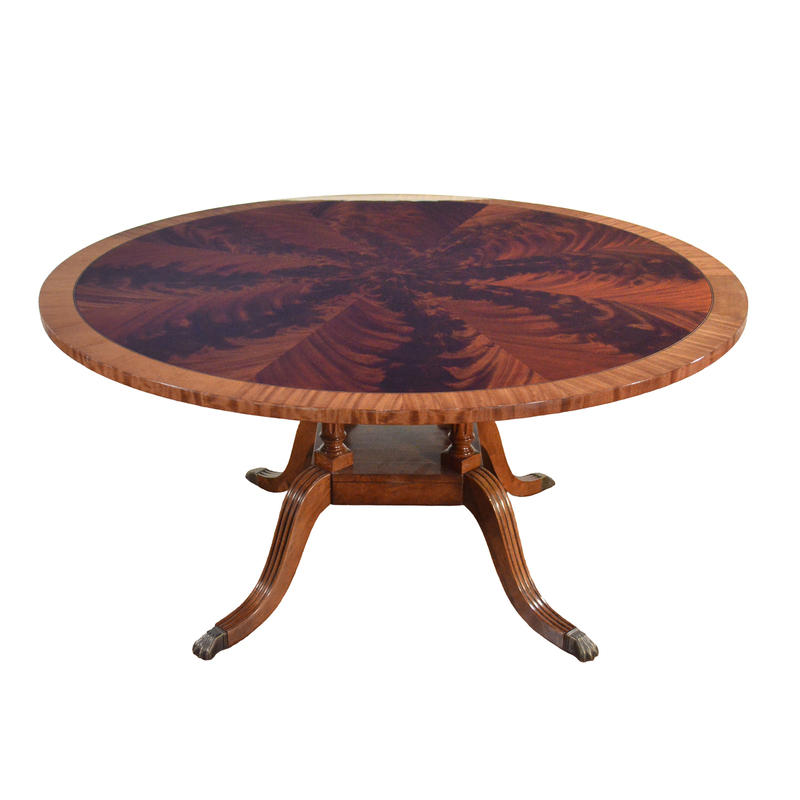 The unique piece is from our Highgate Collection. 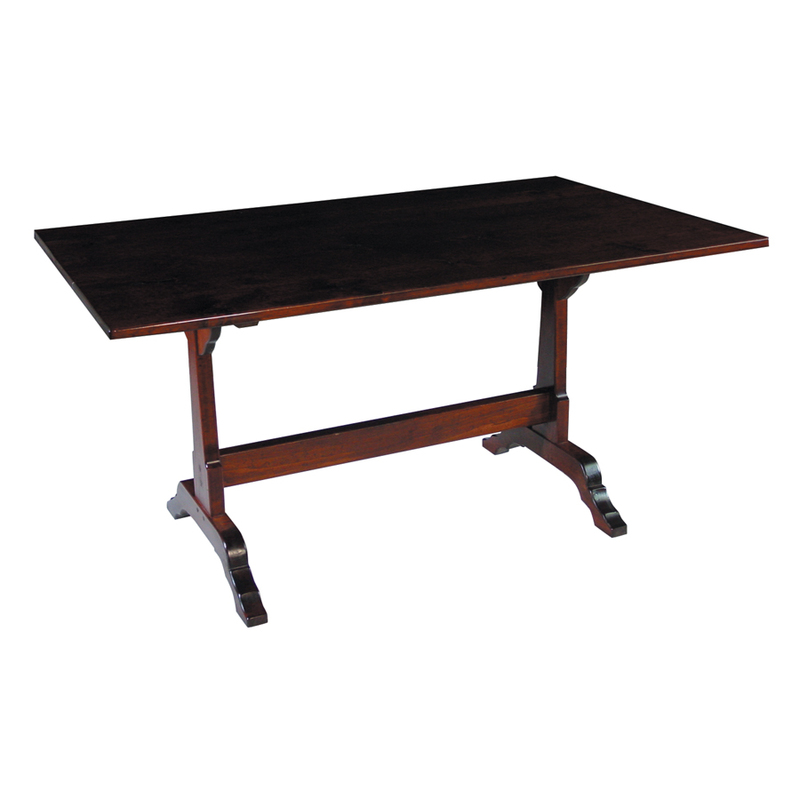 Shown here in mid cherry, the Highgate extending table comes with two 21" leaves Table measures W:66" D:48" H:30" closed. 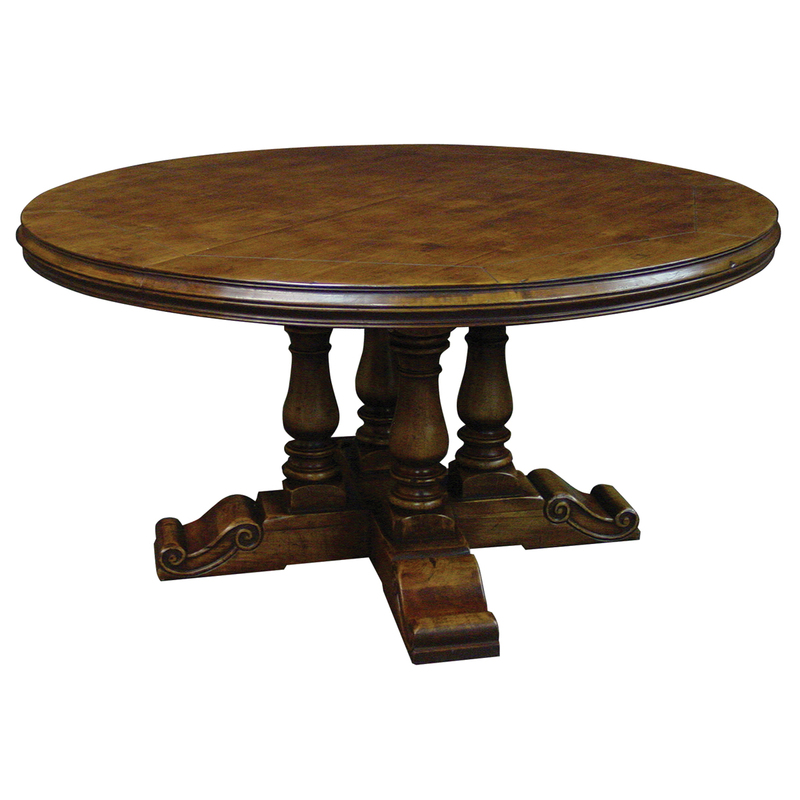 The unique piece is from our Hampstead Collection. 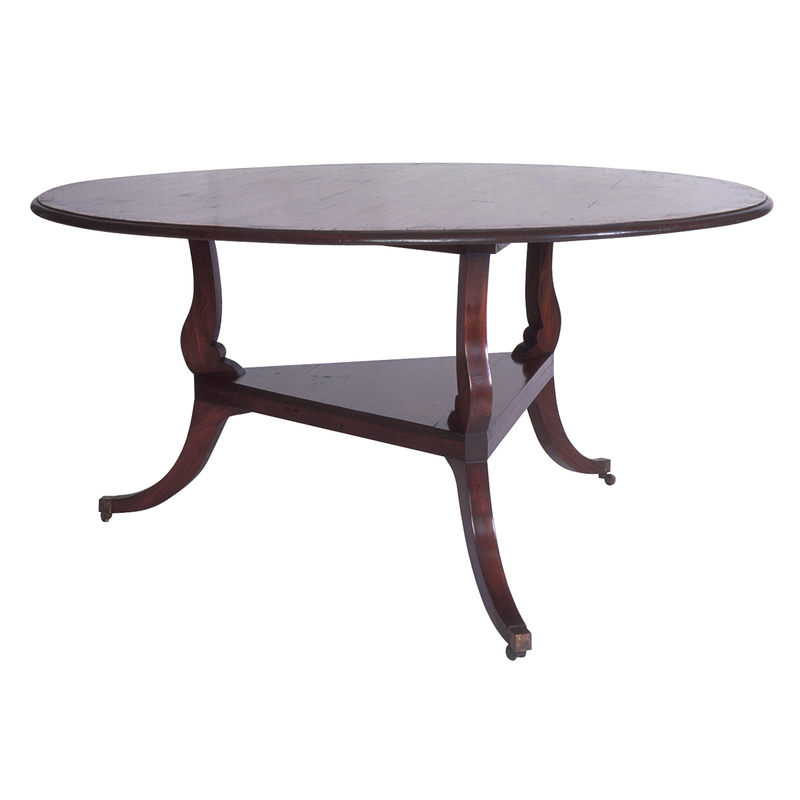 Shown here in Light cherry, the Hampstead oval curved leg base table with 2" inset black etched banding & shoe feet. 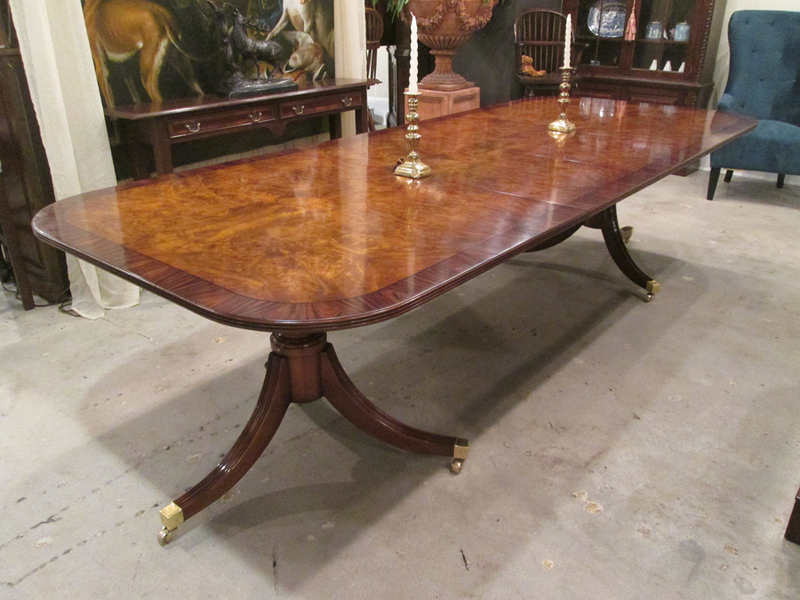 It would be a welcome accent piece to any room. 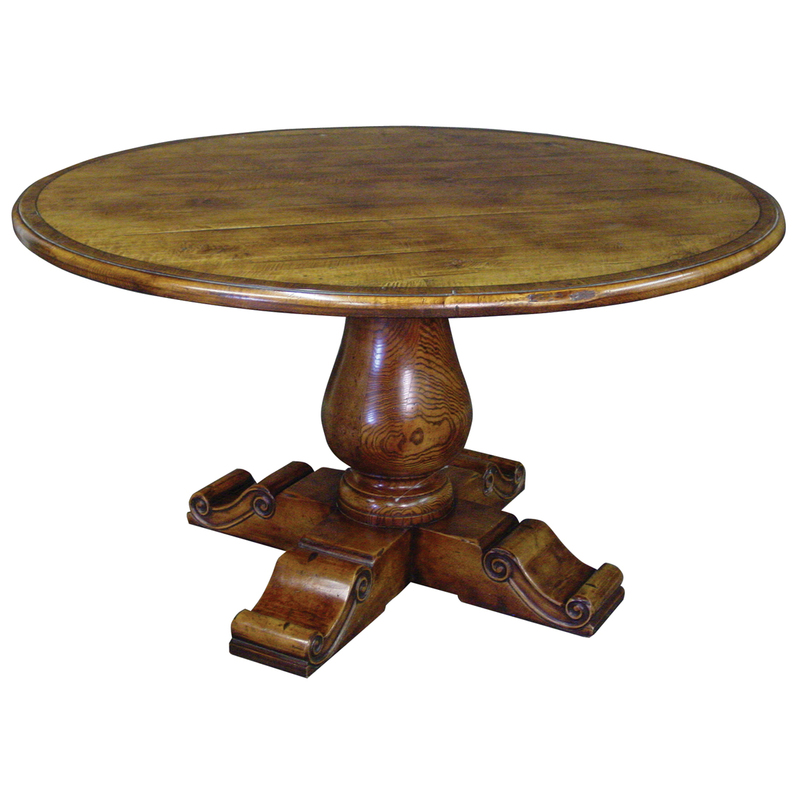 The unique piece is from our Hampstead Collection. 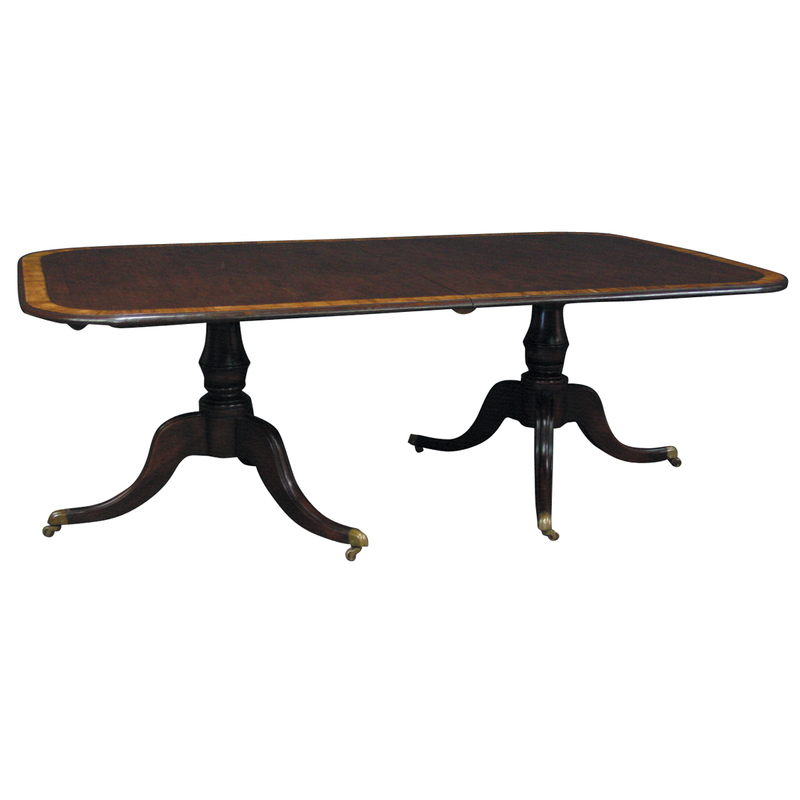 Shown here in Light cherry, the Hampstead extending double pedestal curved leg base table with two 21" leaves, 2" inset black etched banding & shoe feet. 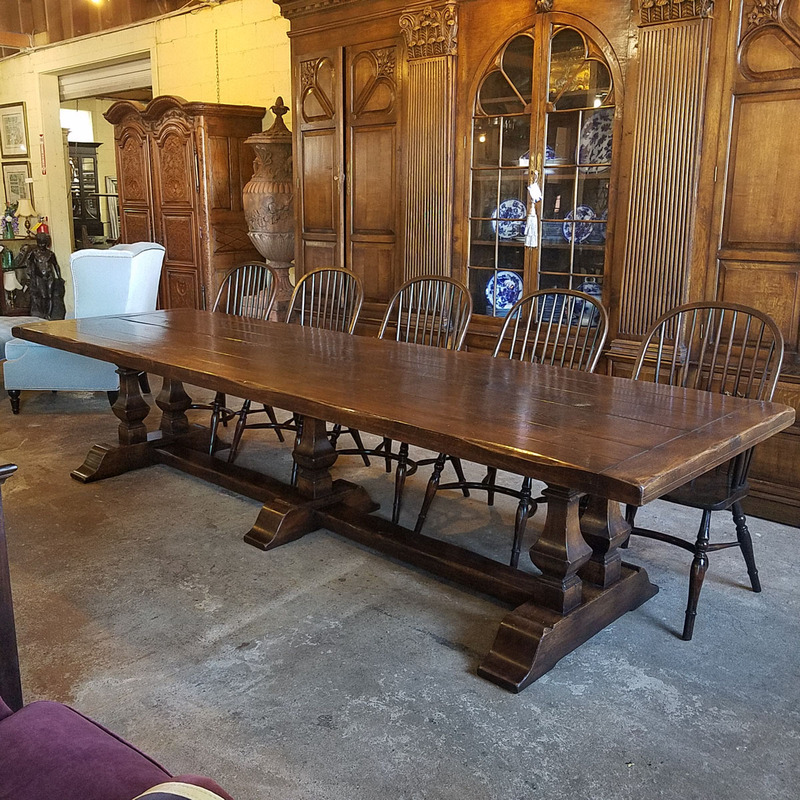 Table measures W:84" D48" H:30" closed. 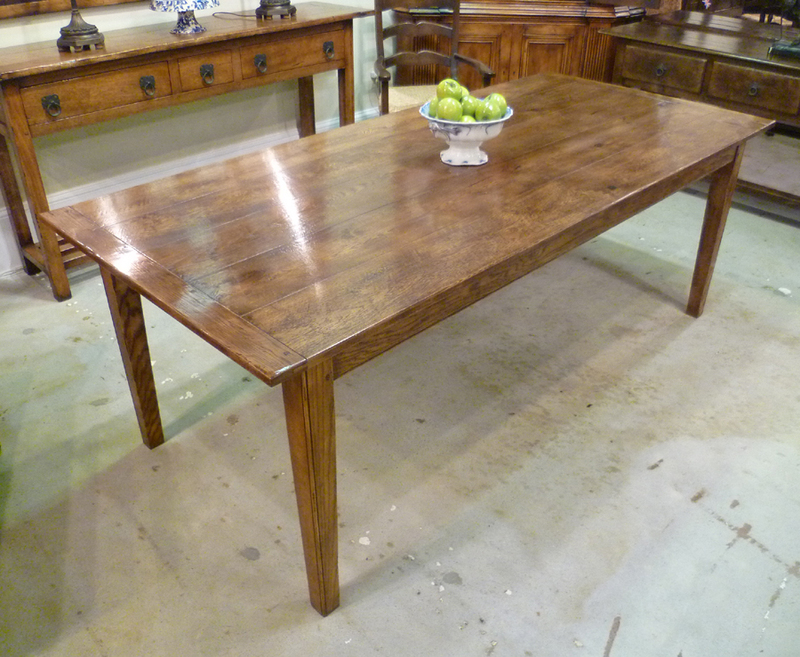 Medium oak finish, cross banded hoof foot drop leaf table. 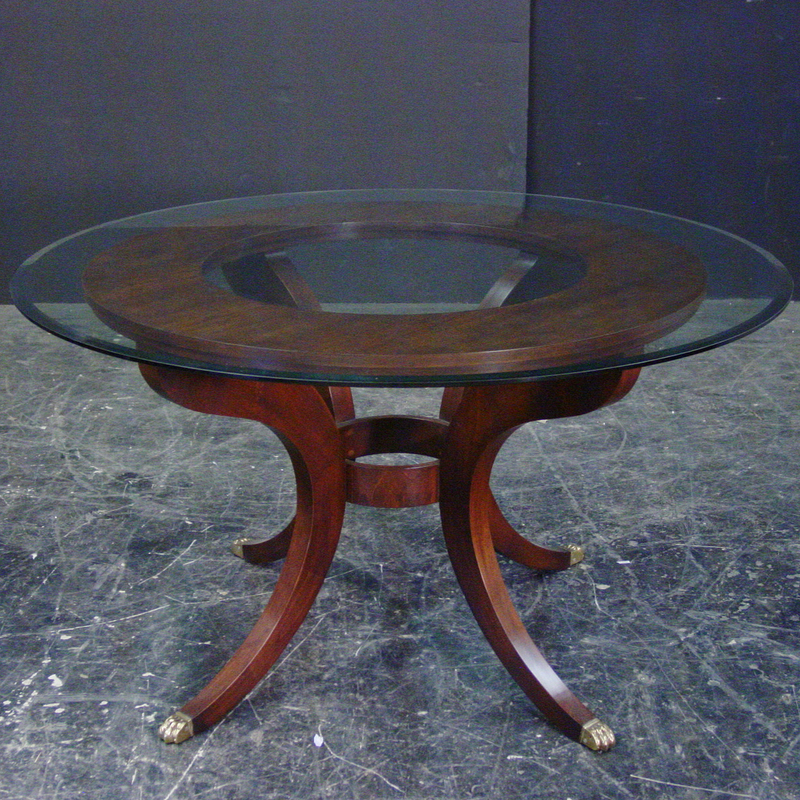 Mahogany 60" round birdcage base table with perimeter leaves. 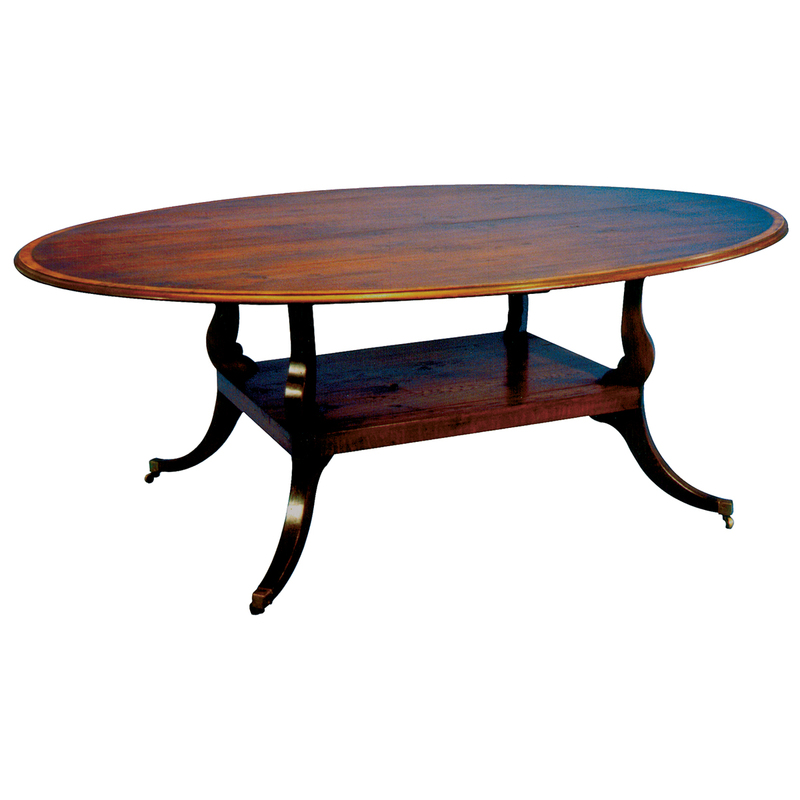 The table expands to 84" round when the outer leaves are attached. 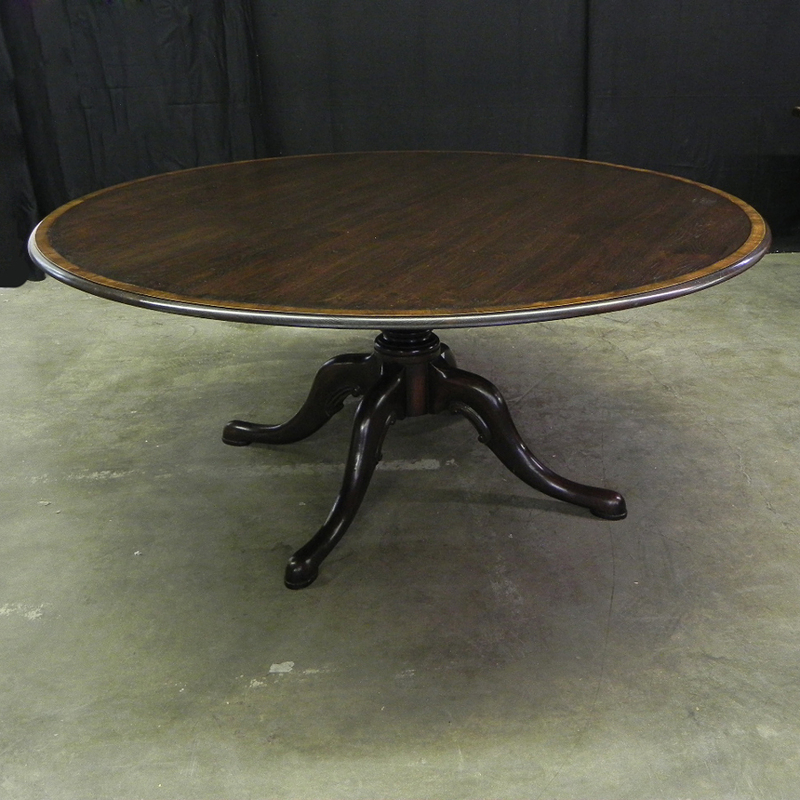 Mahogany 60" round rosewood banded birdcage base extending table with one 22" leaf. 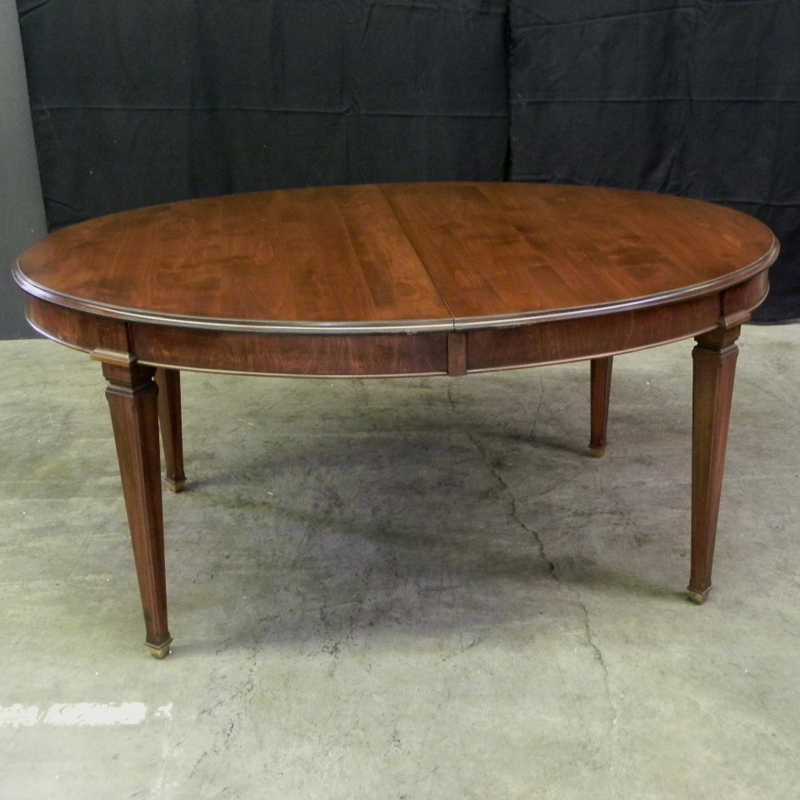 Mahogany, banded double pedestal table with three 22" leaves. 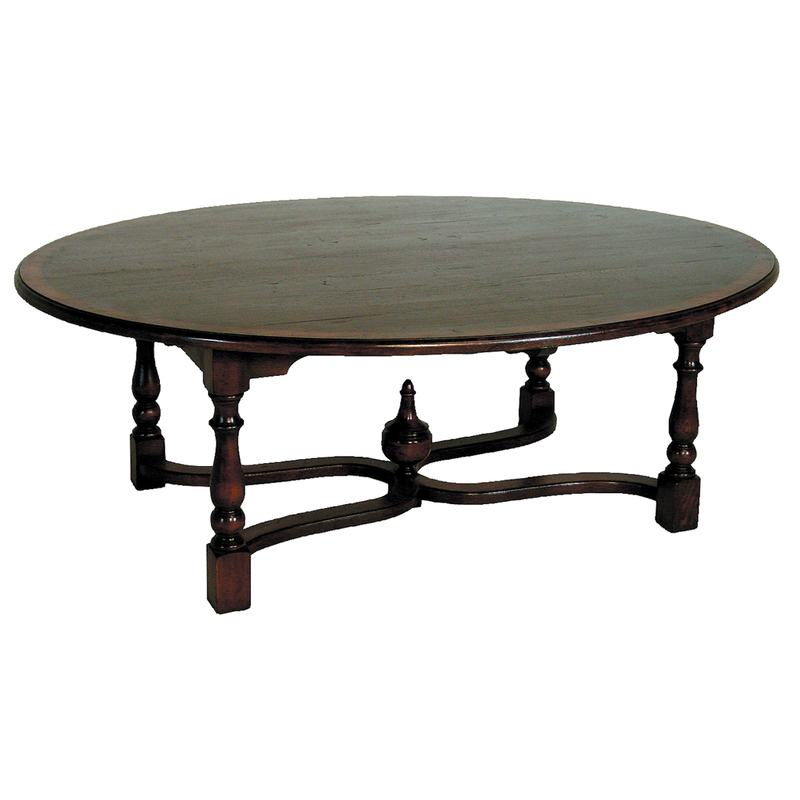 Medium oak finish 60" round French leg stretcher base table with lazy Susan. 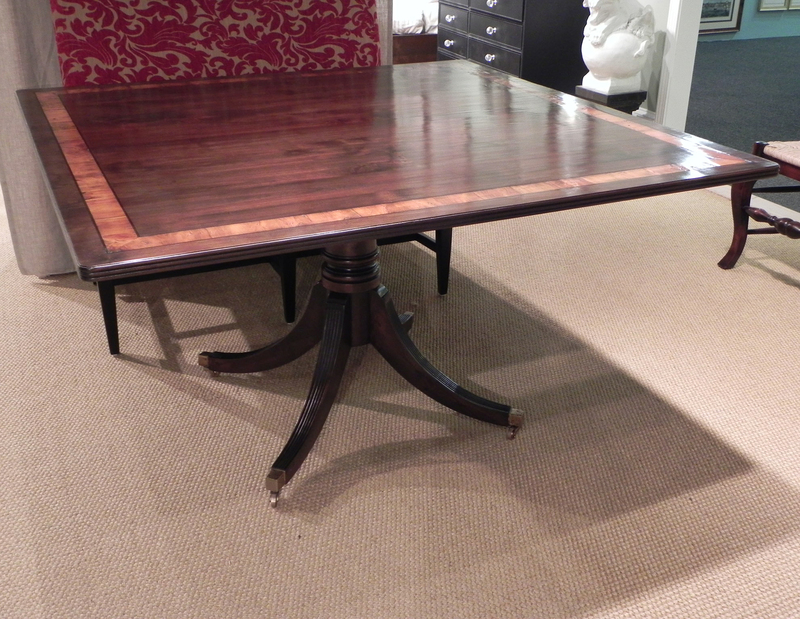 This table is hand made in England by skilled craftsman. 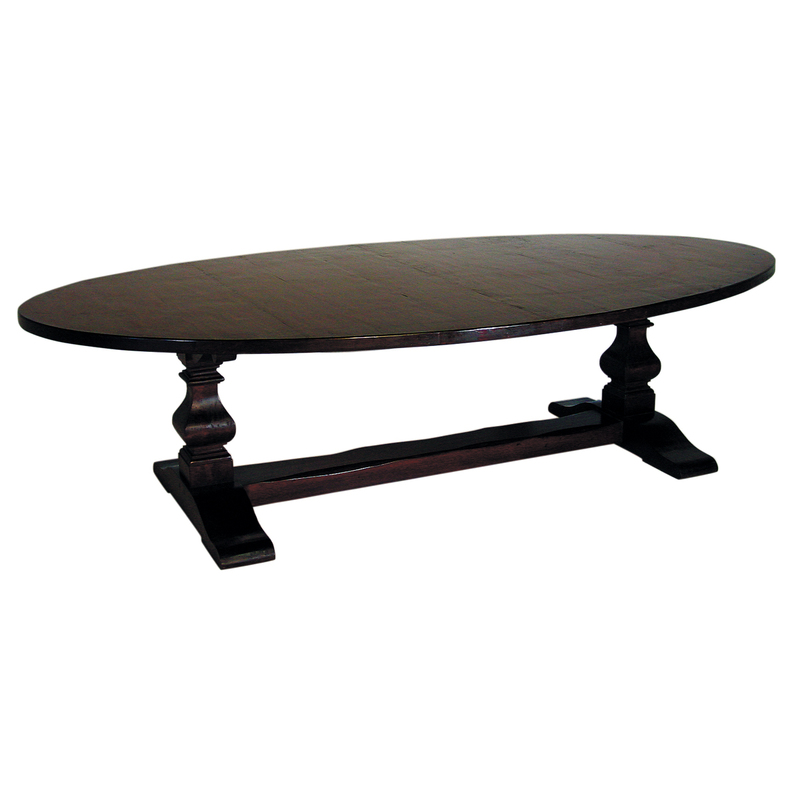 Medium oak finish 60" round pad foot stretcher base table with lazy Susan. 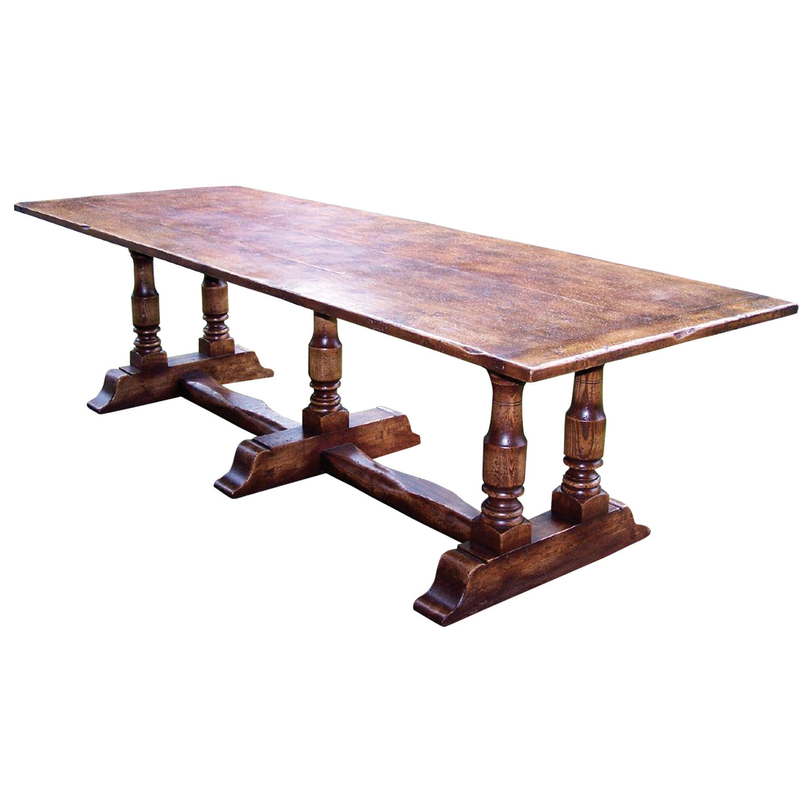 This table is hand made in England by skilled craftsman. 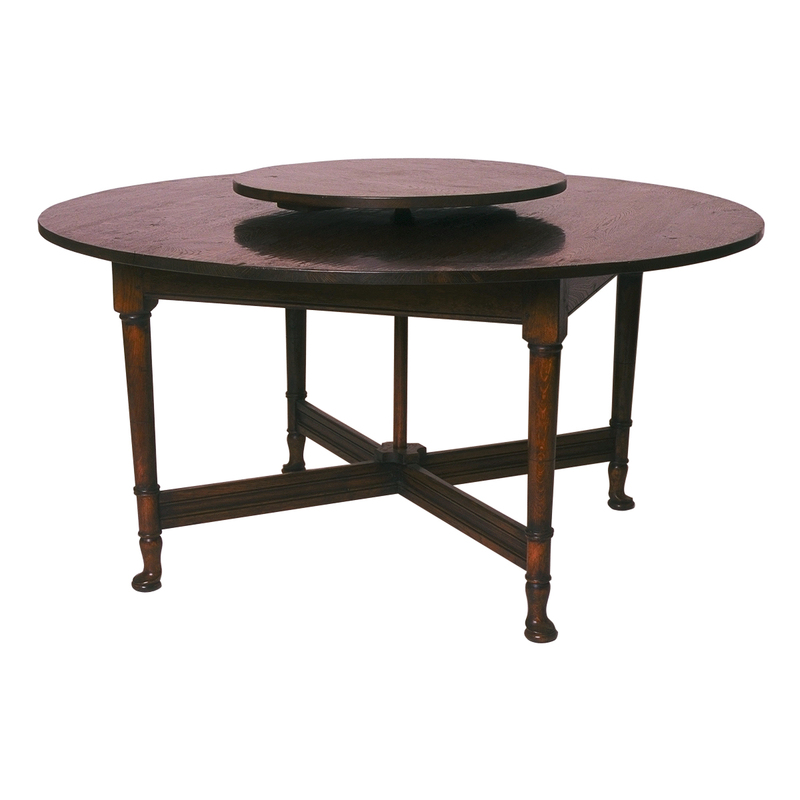 Medium oak finish 60" round pad foot table with stretcher. 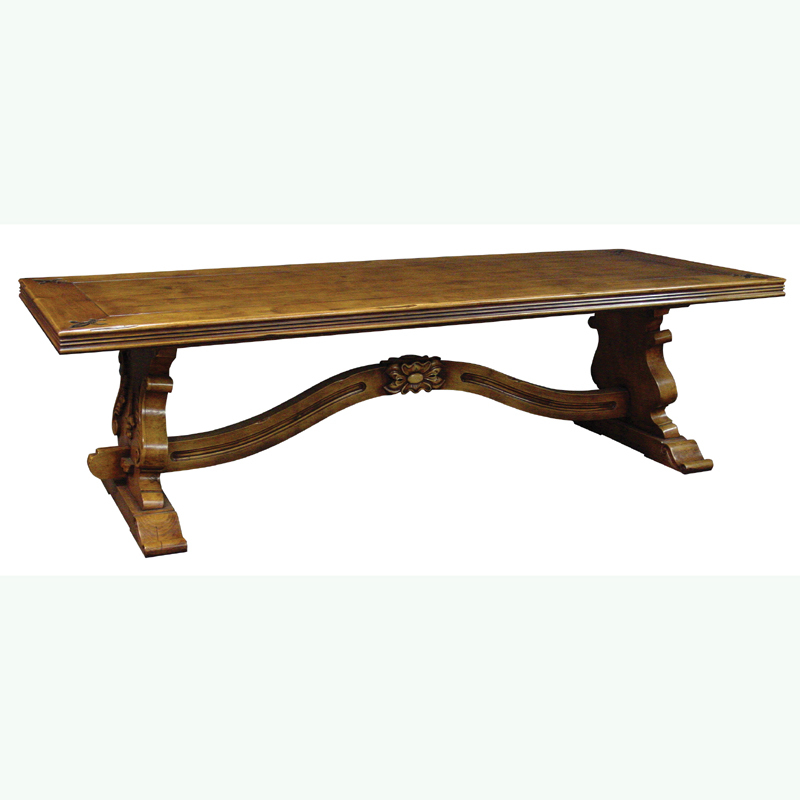 This table is hand made in England by skilled craftsman. 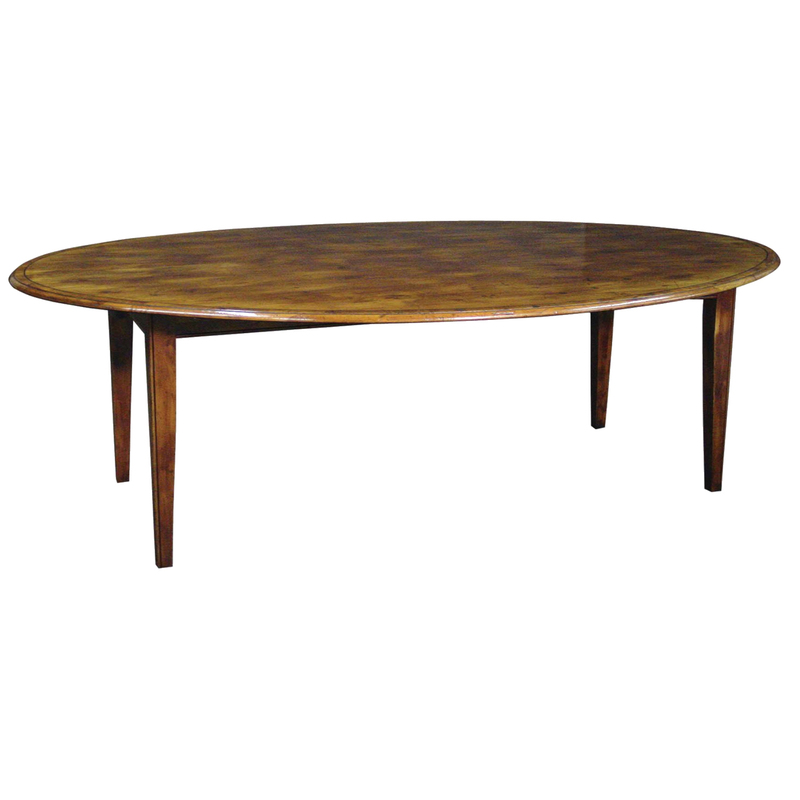 Medium oak finish, cross banded 48" round 3 splay pedestal table. 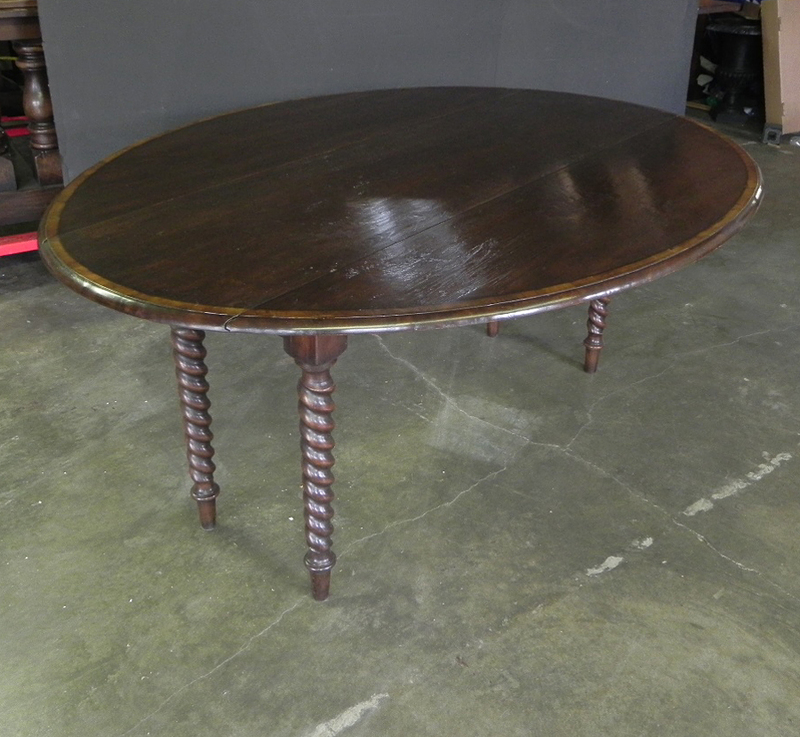 Medium oak cross banded 60" round pedestal table. 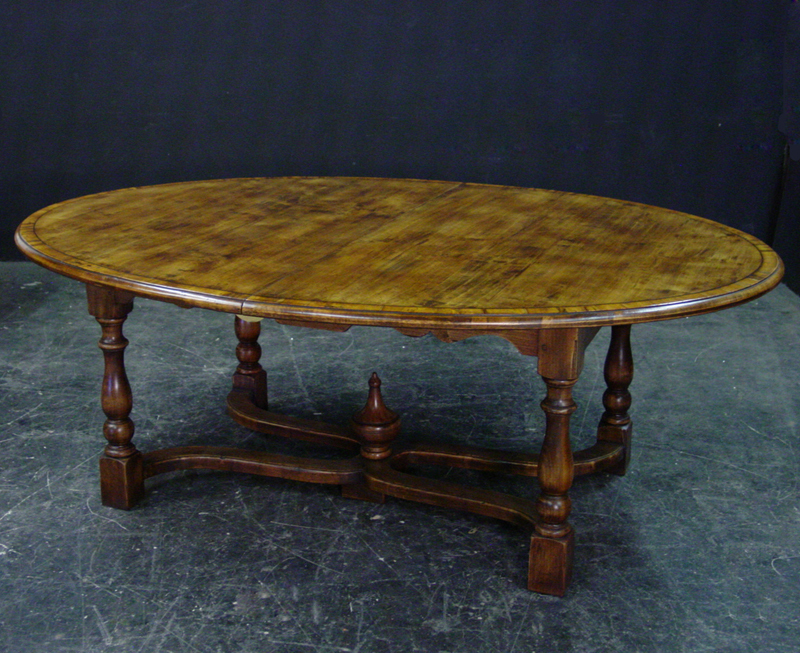 Medium oak finish, cross banded 60" round 4 splay spoon foot pedestal base table. 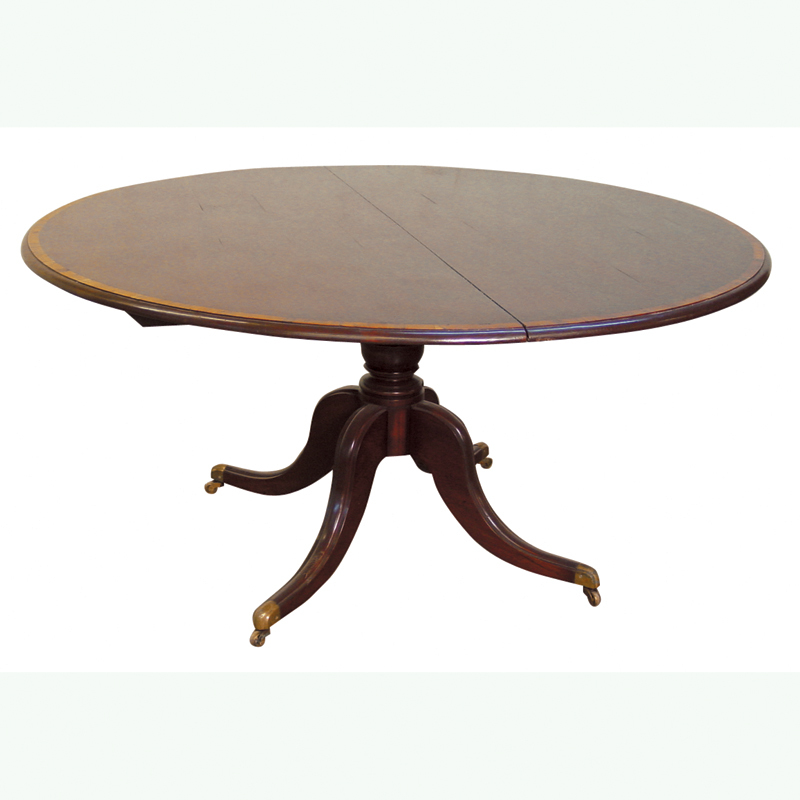 Also available in a 54" round pedestal table. 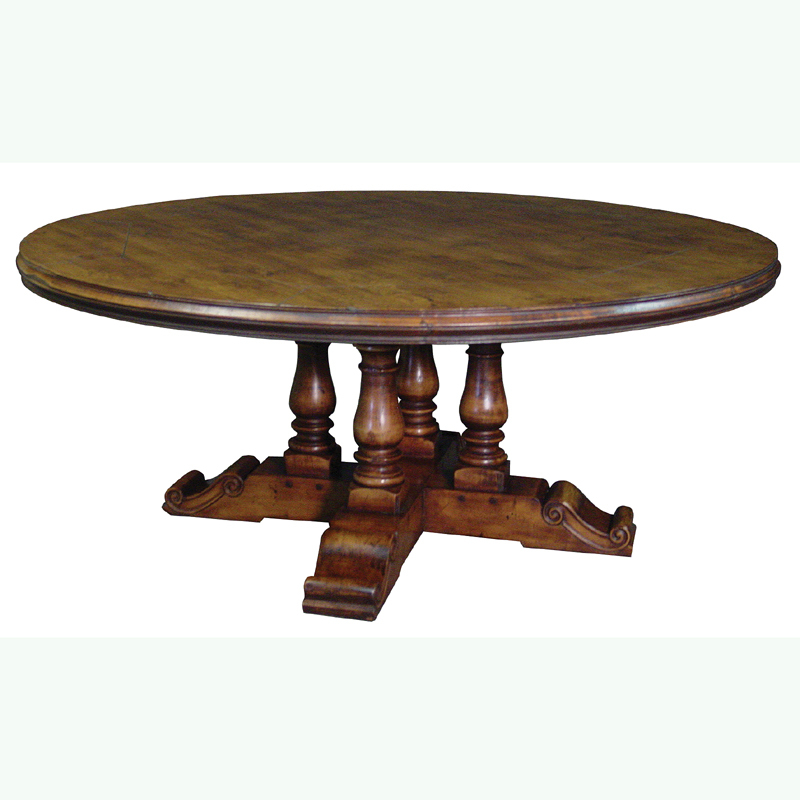 Medium oak finish, cross banded 72" round 4 splay "C" scroll spoon foot pedestal base table. 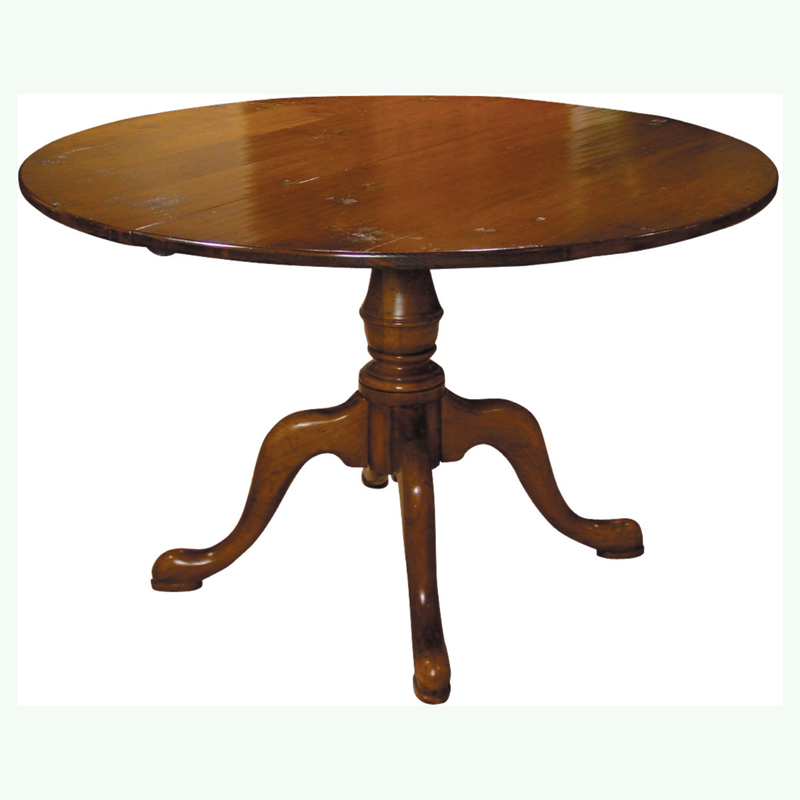 Medium oak rustic finish 60" round 4 baluster pedestal table. 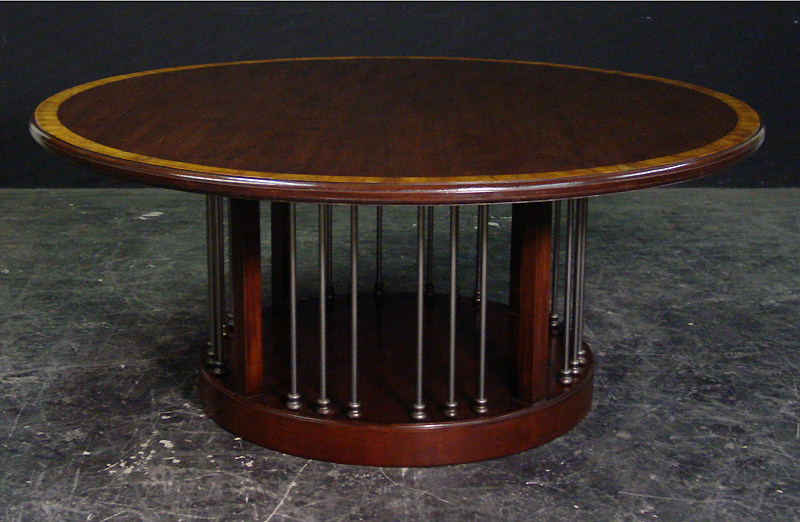 Mid cherry, yew wood banded 6' round tapered leg table. 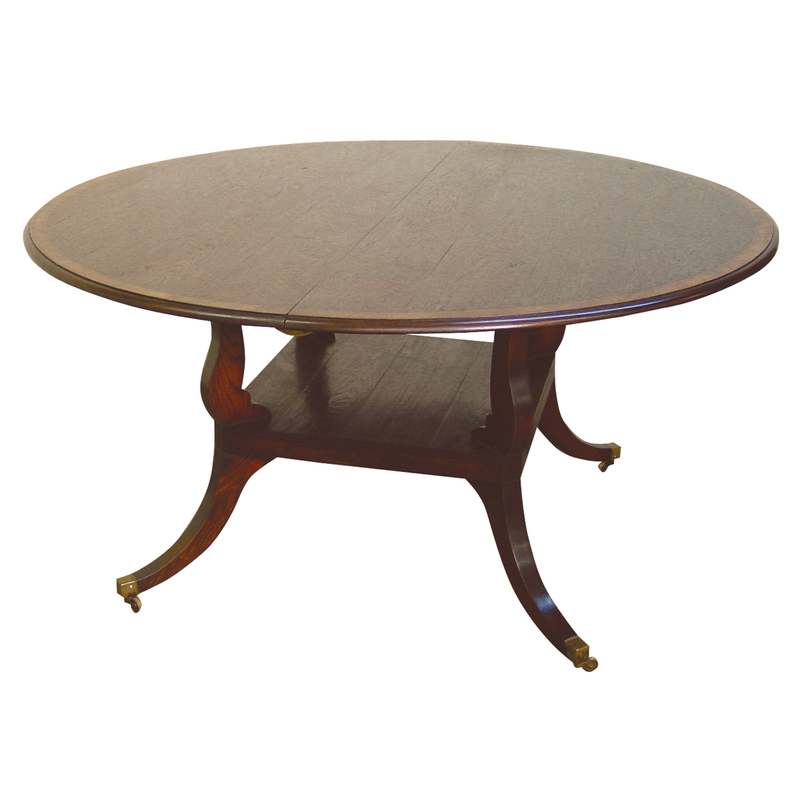 This table is hand made in England by skilled craftsman. 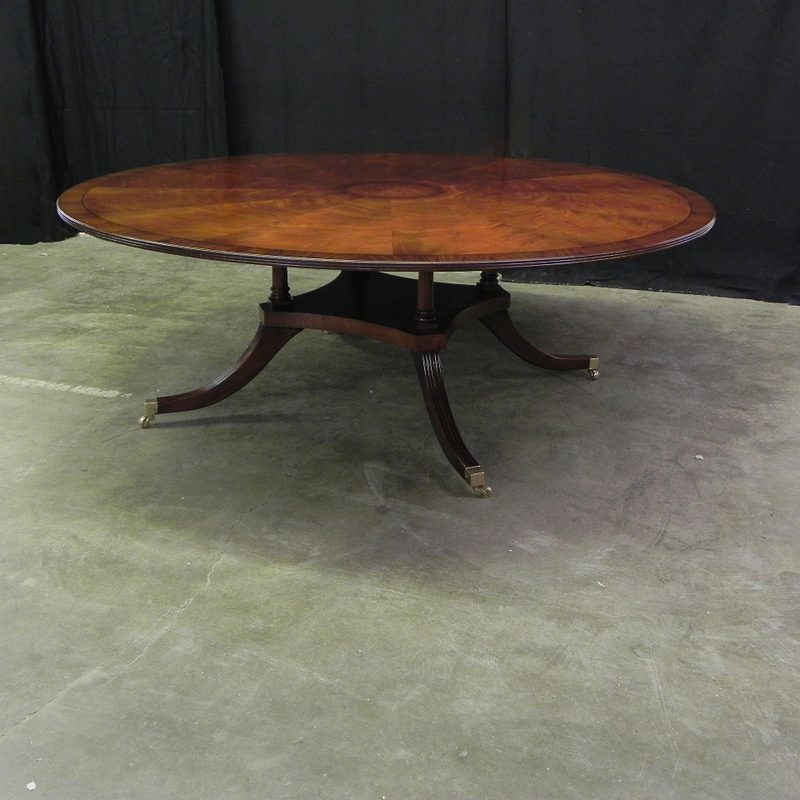 Mid cherry finish, 60" round French leg table with stretcher. 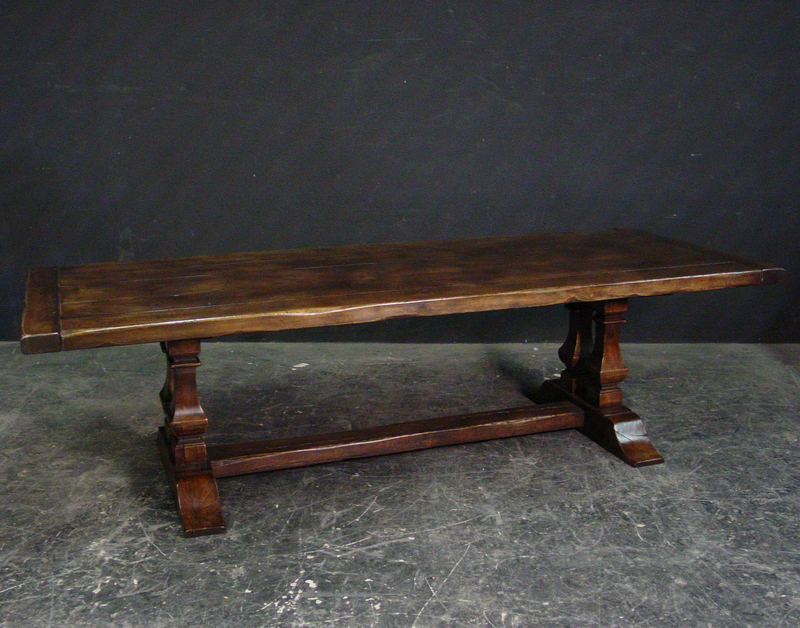 This table is hand made in England by skilled craftsman. 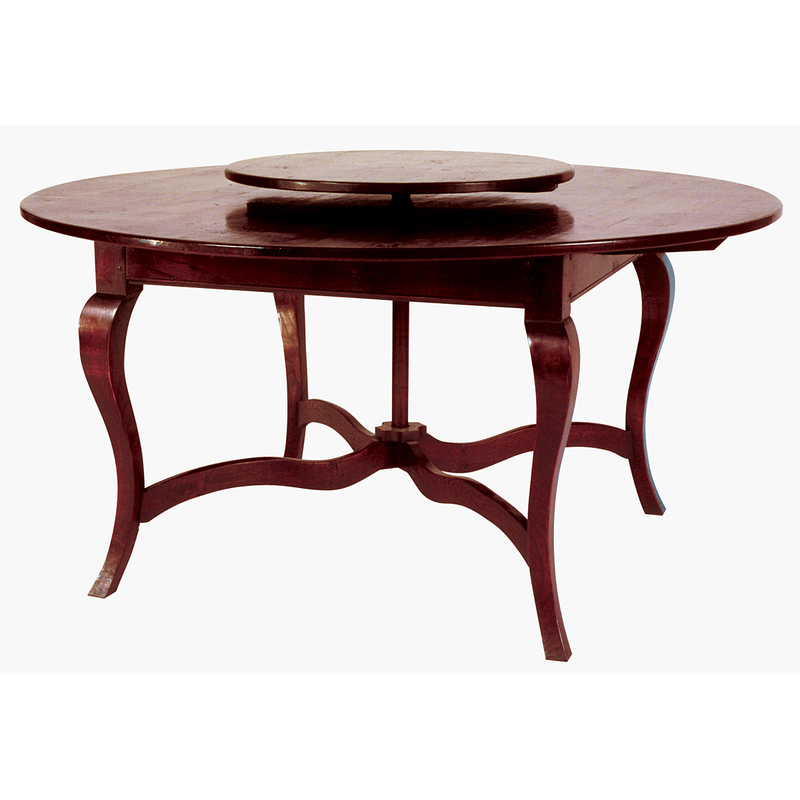 Mid cherry finish 60” round birdcage base table with 2-19" leaves. 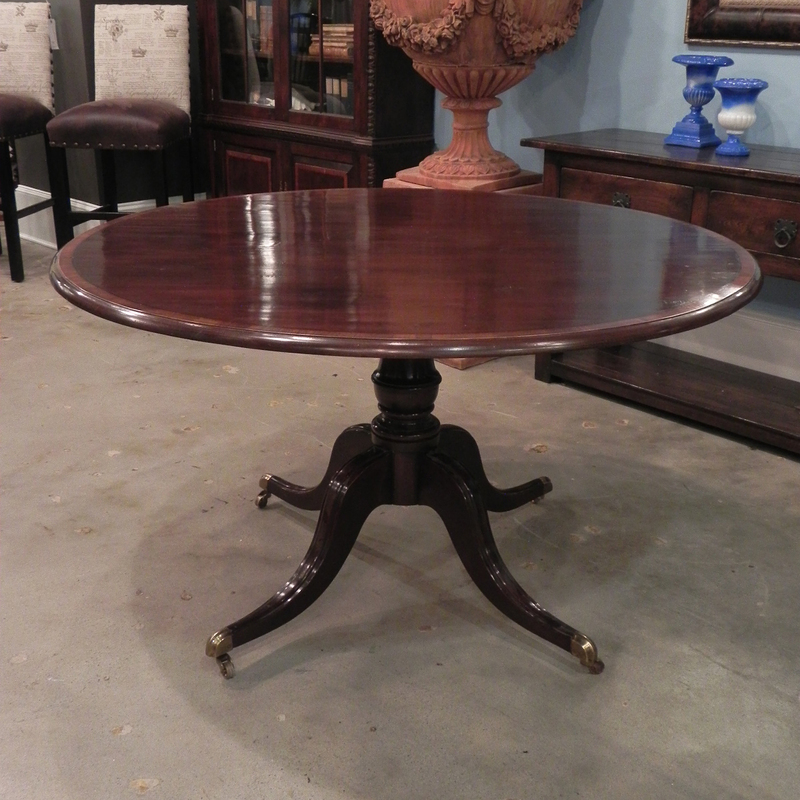 Mid cherry finish, cross banded 54" round pedestal table with casters. 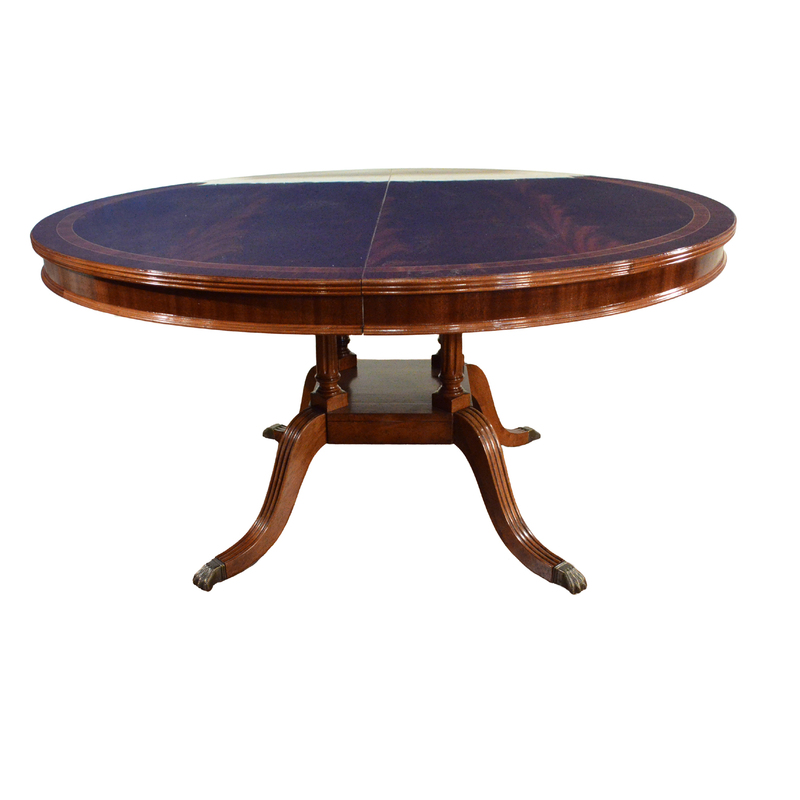 Mid cherry finish, yew wood banded 54" square pedestal table. 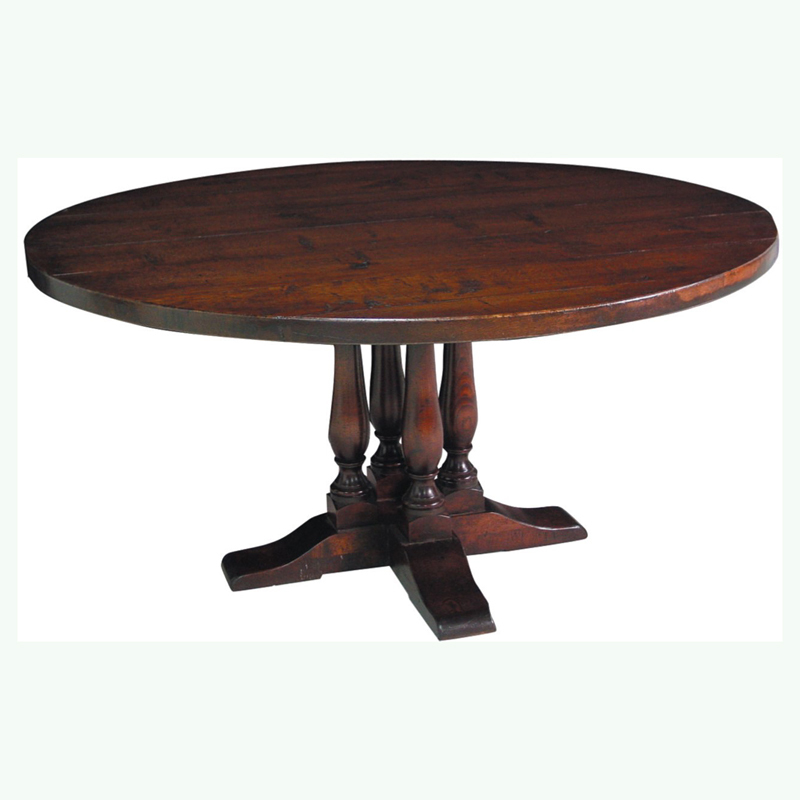 Mid cherry finish 6’-0” round quad-leg pot board base table with casters. 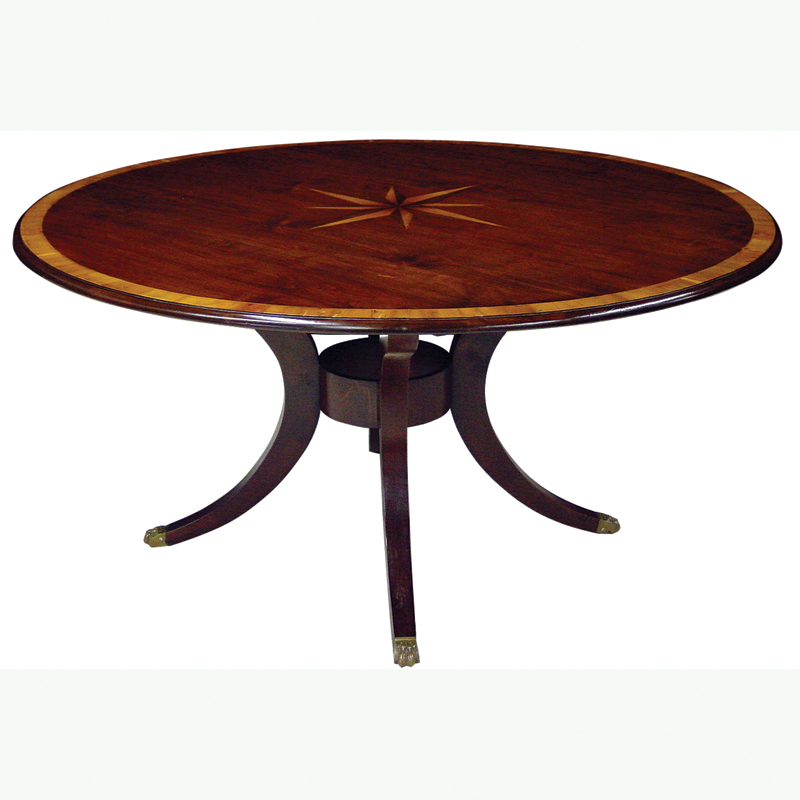 Mid cherry finish, yew wood banded 72” round table with starburst inlay on curved leg base. 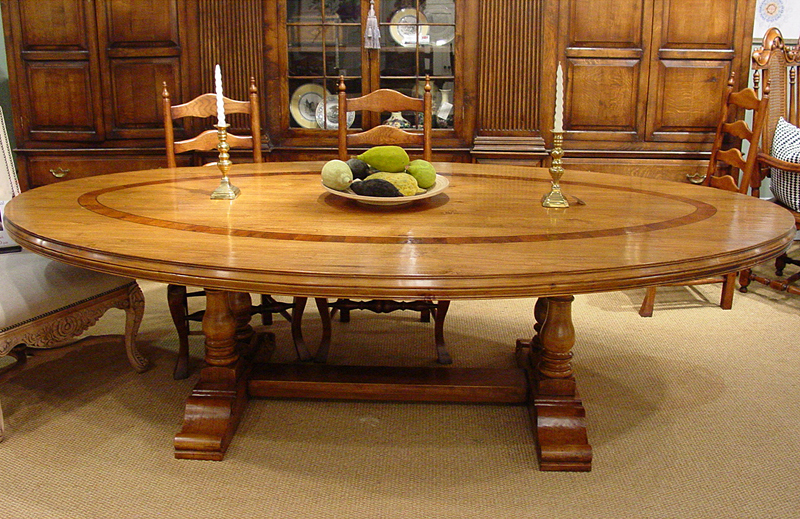 Mid cherry finish, yew wood banded 3 splay double pedestal table with two 21" leaves. 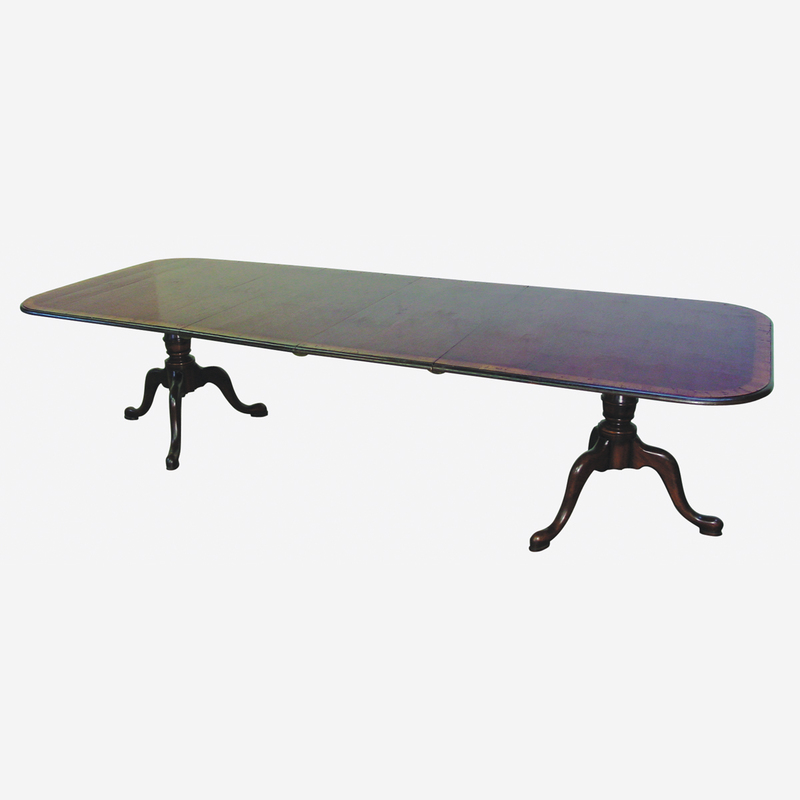 This table is hand made in England by skilled craftsman. 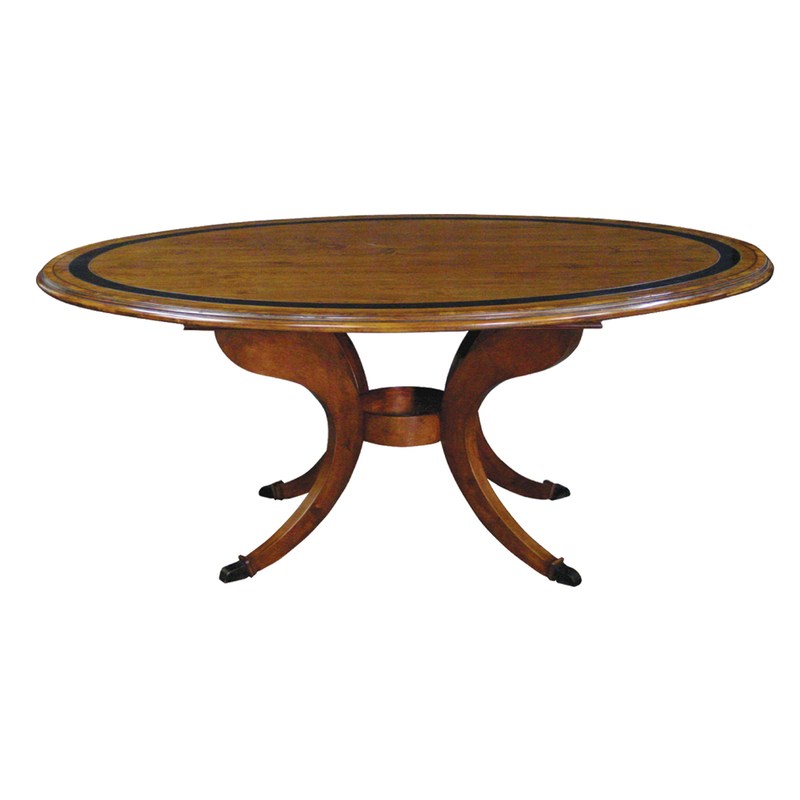 Mid cherry finish, yew wood banded 60" round expanding pedestal table with one 18" leaf. 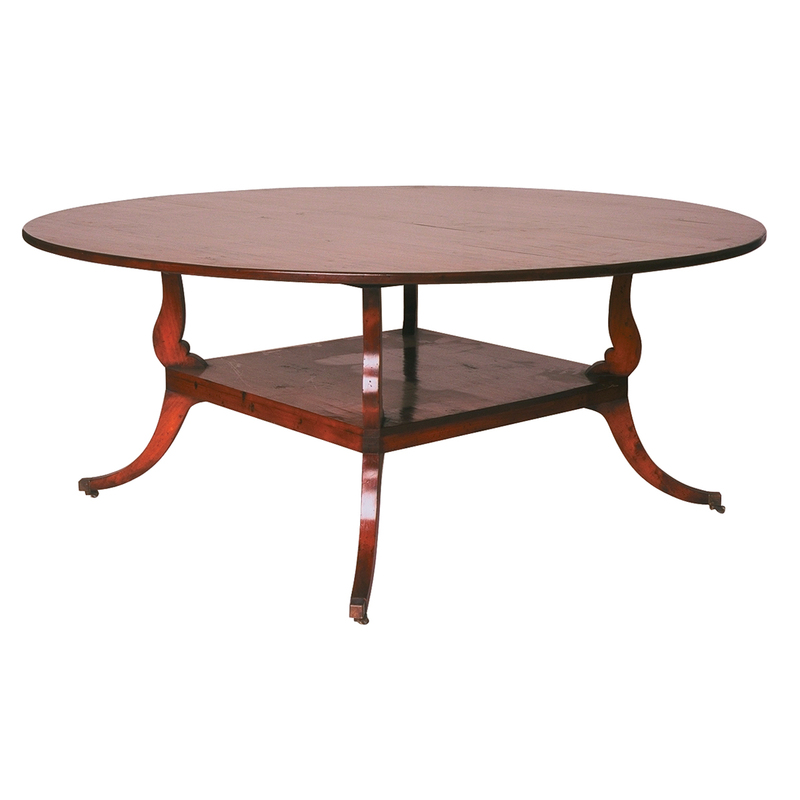 ‍Mid cherry finish, yew wood banded 72" round curved leg base table with starburst inlay flush lazy Susan. 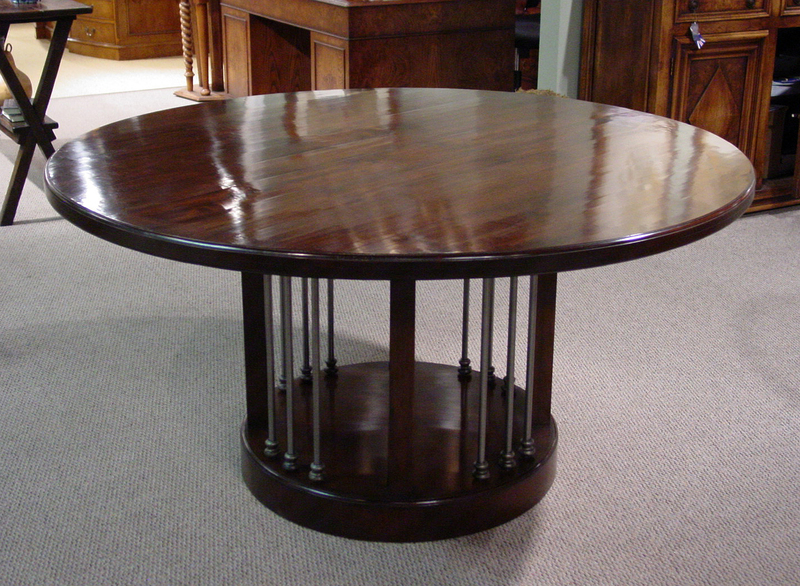 Mid cherry finish, 72" round table with inset banding & iron rods in round base. 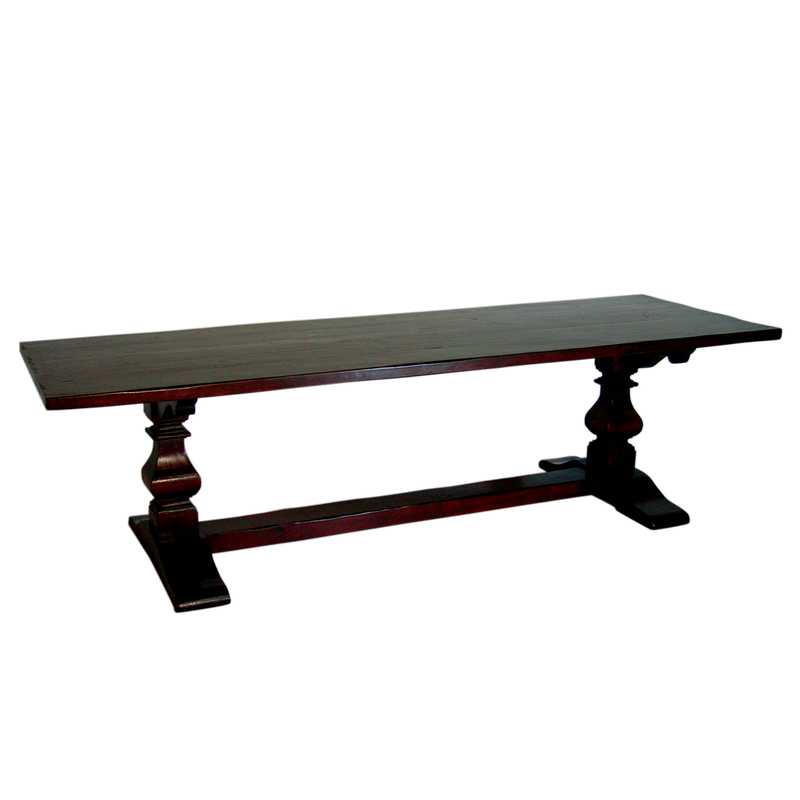 This table is hand made in England by skilled craftsman. 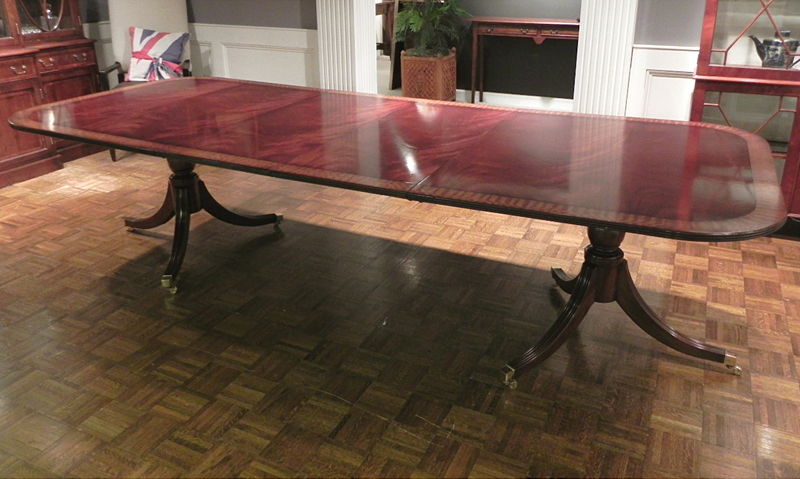 Mid cherry finish, yew wood banded 3 splay spoon foot double pedestal table with two 21" leaves. 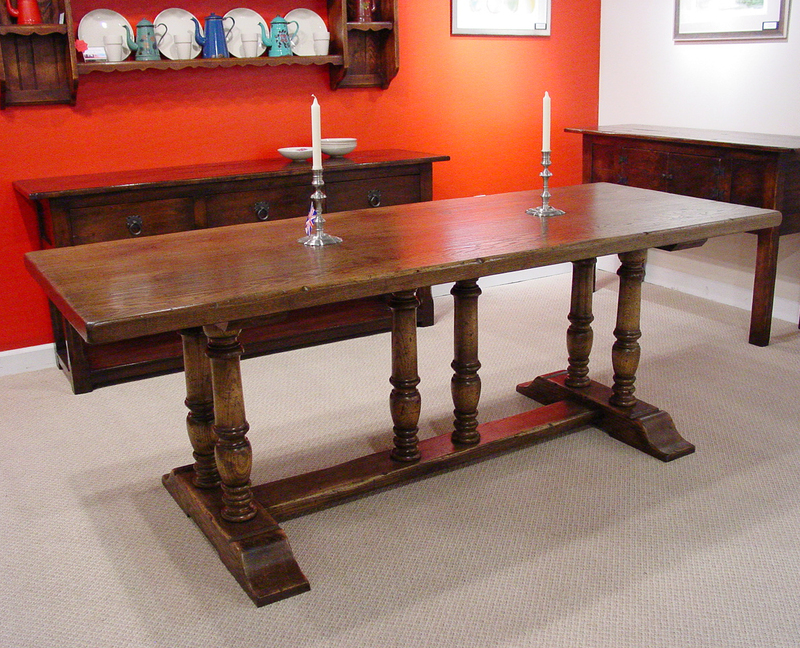 This table is hand made in England by skilled craftsman. 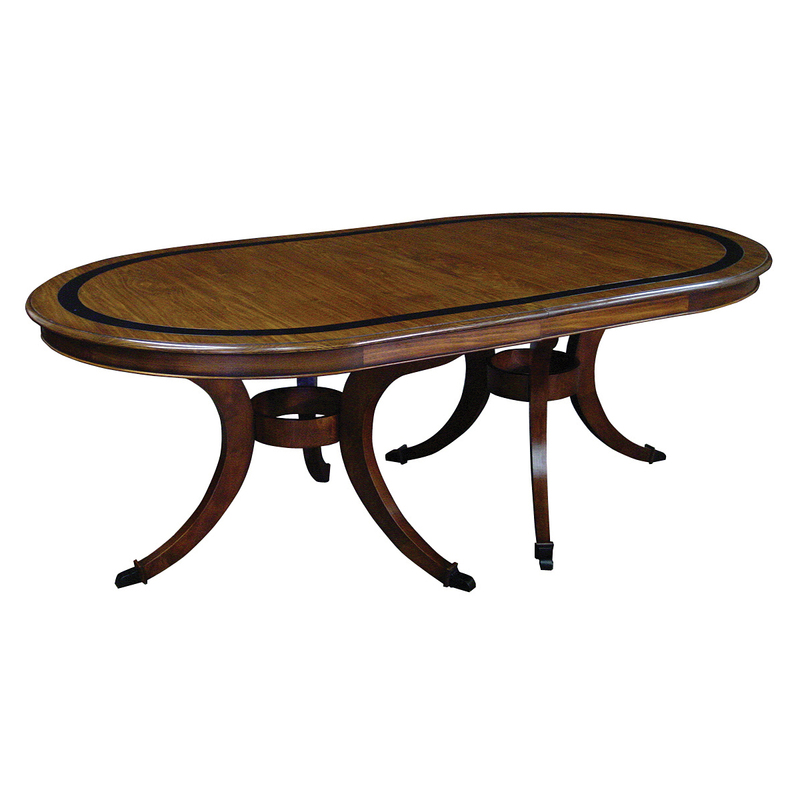 Mid cherry finish, yew wood banded 60" round quad leg potboard base extending table with two 19" leaves. 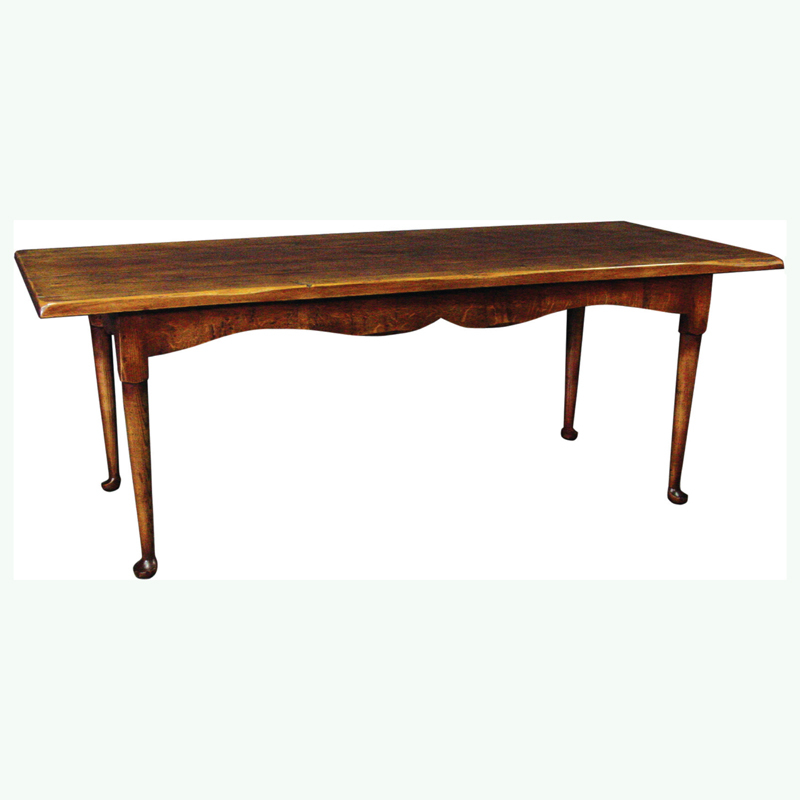 This table is hand made in England by skilled craftsman. 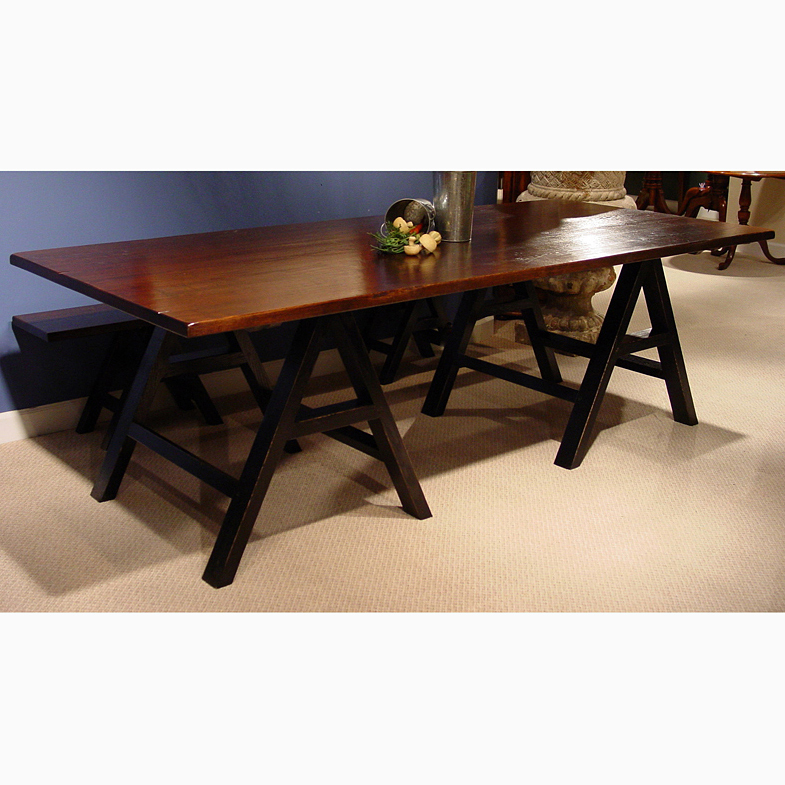 Oak finish tapered leg farmhouse style table with 3 panels . 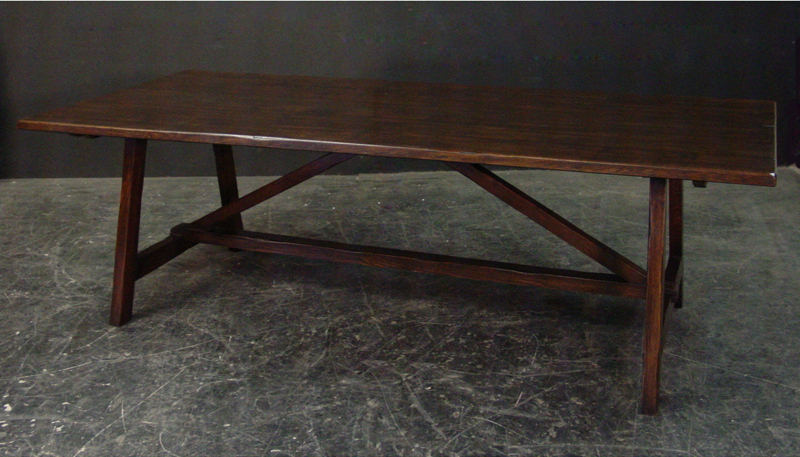 Also available with 2 panel top. 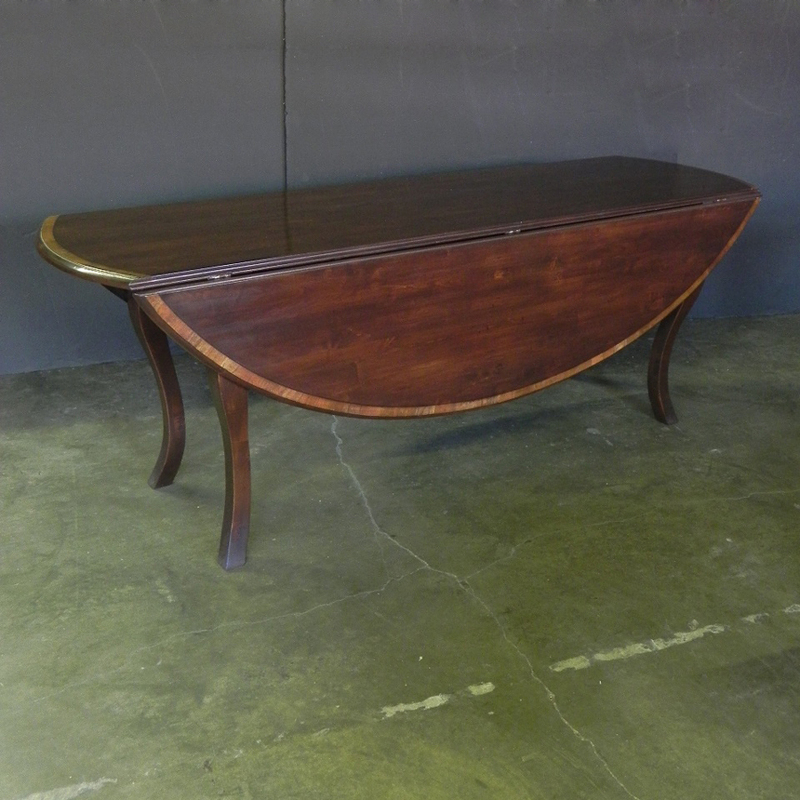 Size: W:84" D:42"
Mid cherry finish oval fixed top table on trestle base. 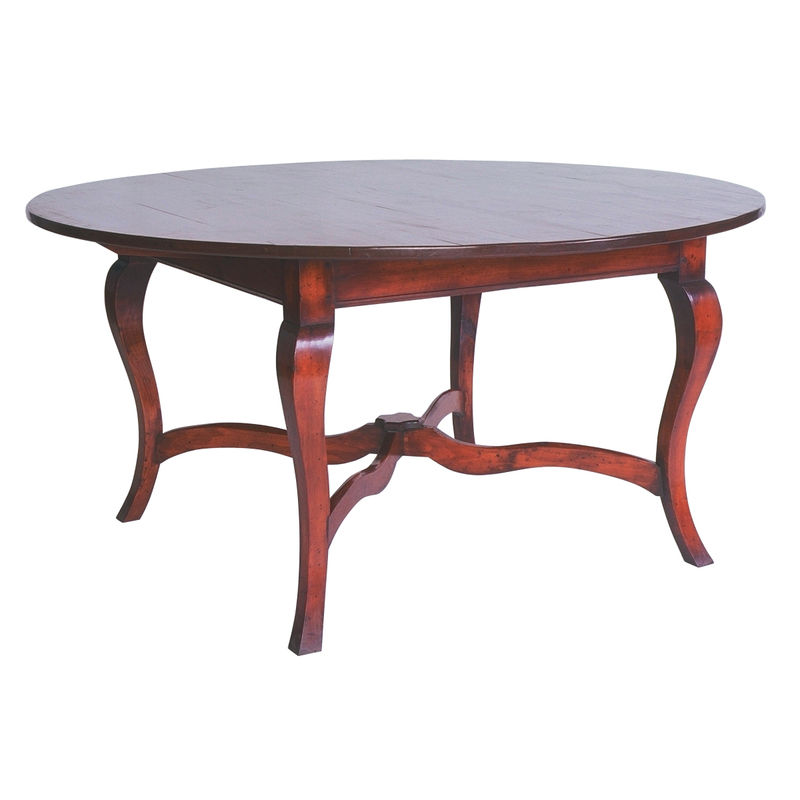 this is a simply elegant table that would be a beautiful addition to your kitchen & home. 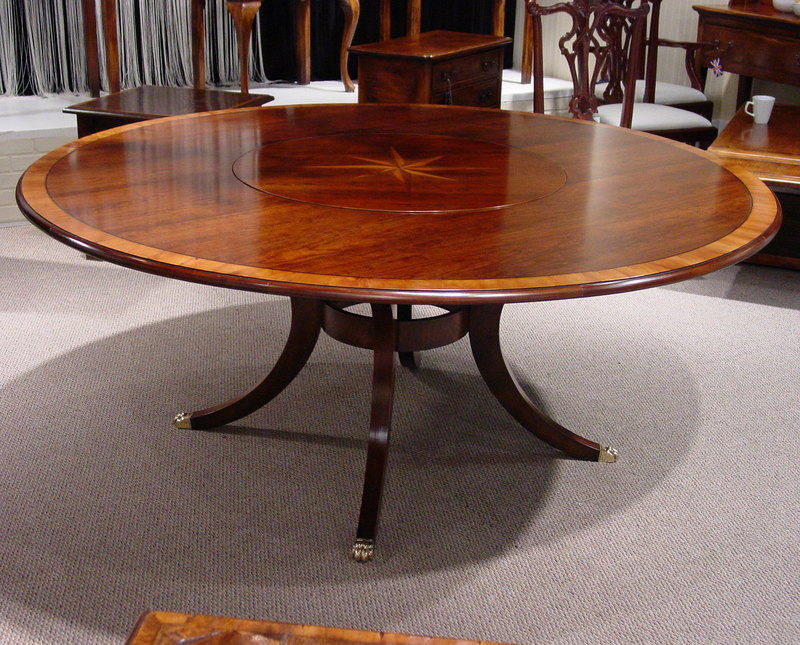 Hand made & finished in England by skilled craftsman. 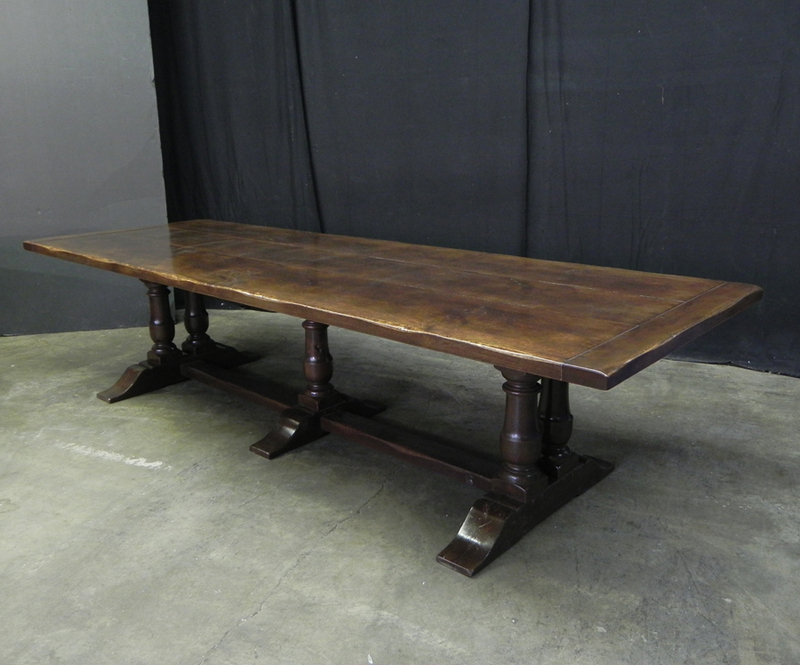 Antique oak finish 7' X 3' rustic pad foot kitchen table with scalloped apron. 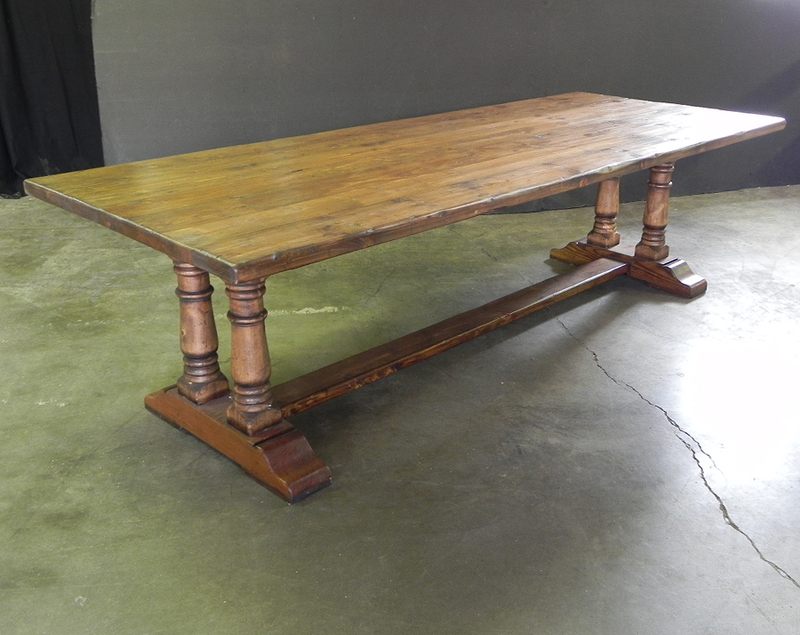 This table will make a nice addition to a family kitchen or dining room. Hand made & finished in England. 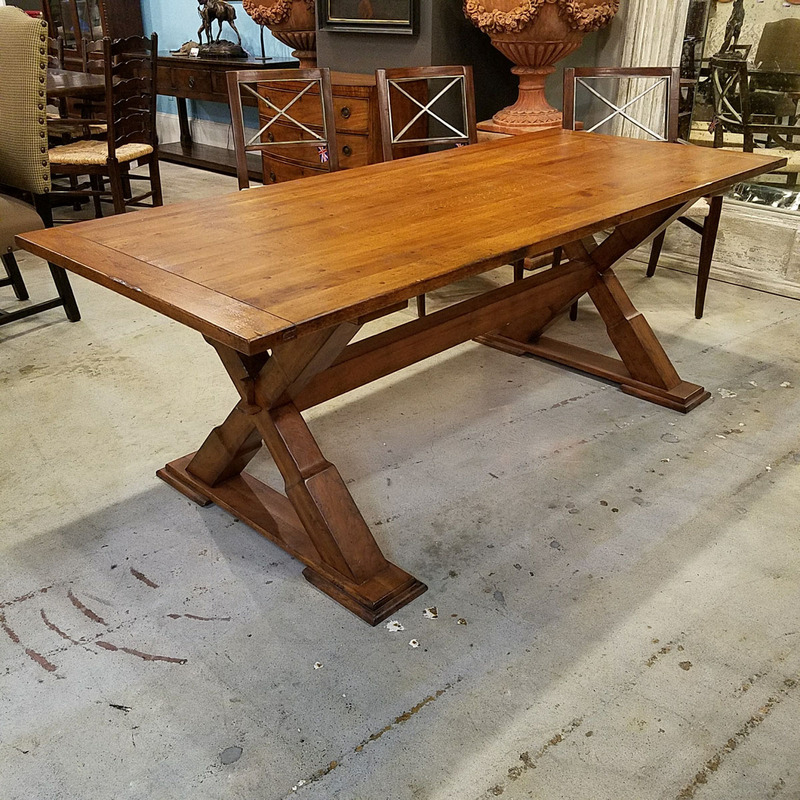 Mid cherry finish rectangular fixed top table with trestle base. 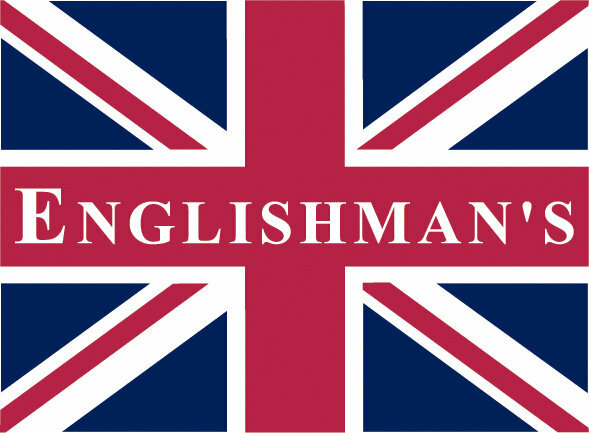 Hand crafted & finished in England by true artisans. 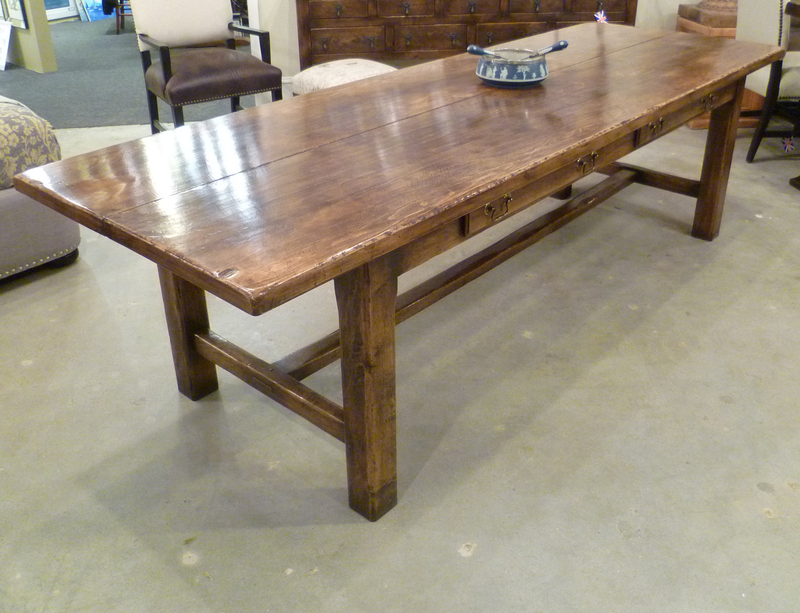 Rustic Oak finish, multi board top Norfolk Mead trestle base refectory table with no middle leg. 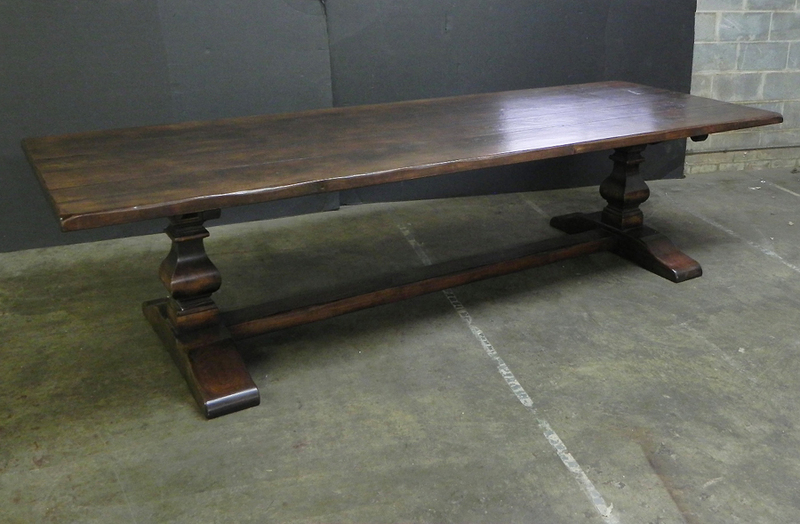 This table is part of our Age of Oak Collection. Each item is hand-made & one of a kind. The item can be repeated but there will always be slight variations. 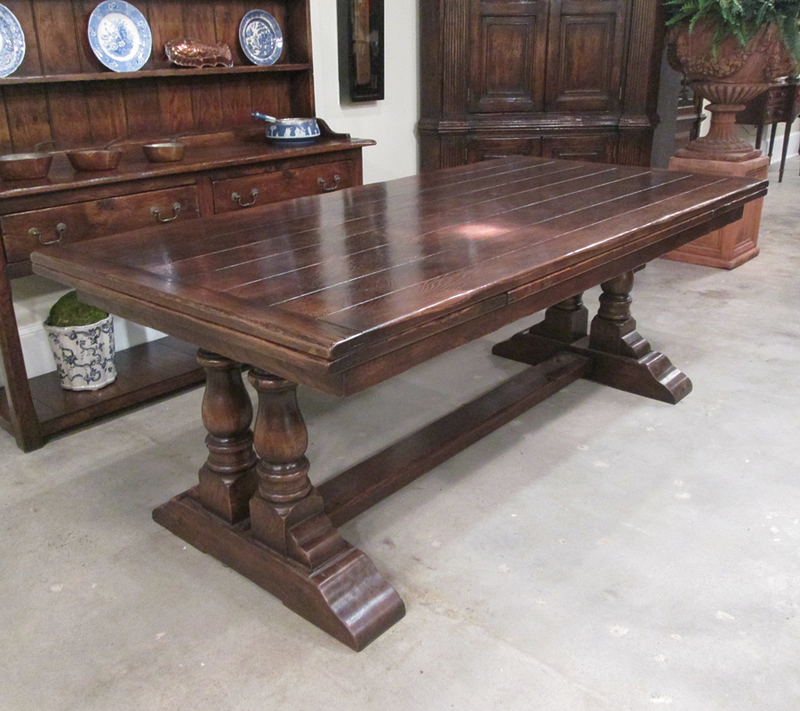 Rustic oak finish 2" thick top trestle base refectory table with twin turned columns. 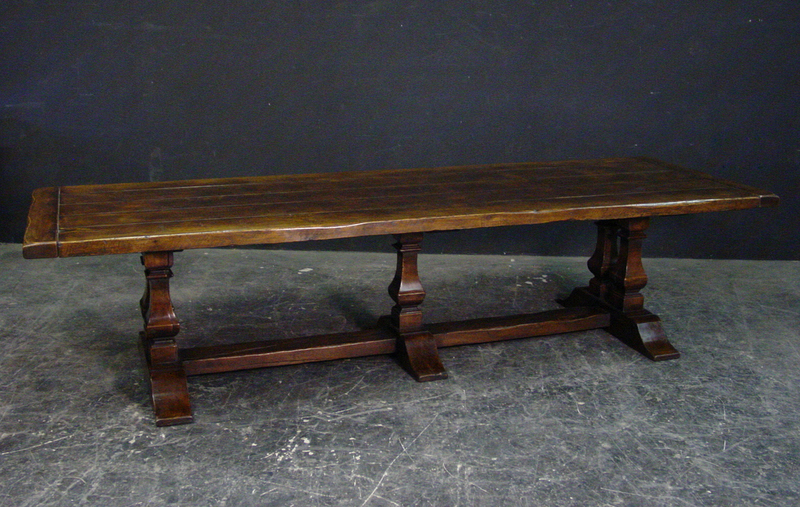 Rustic oak finish 2" thick top trestle base square baluster leg refectory table. 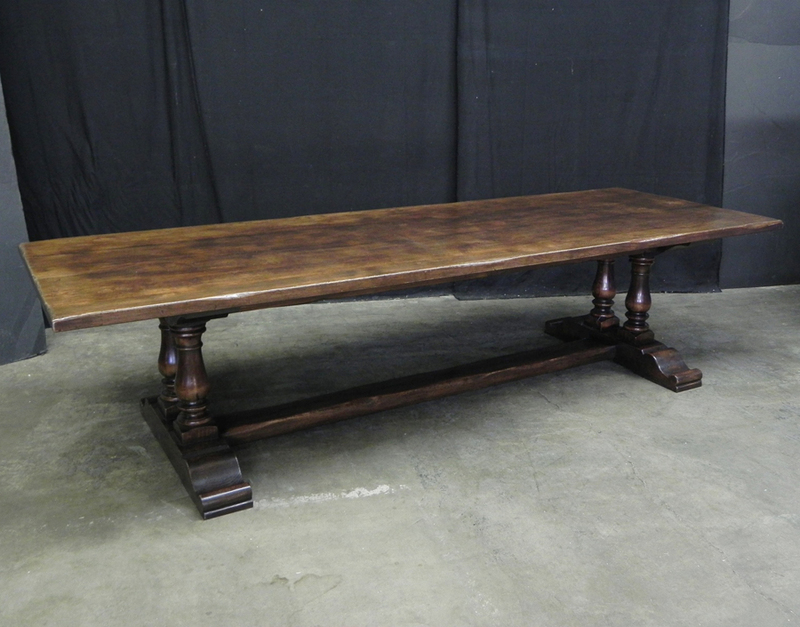 Antique cherry finish scored pattern top twin baluster trestle base refectory table with scroll feet. 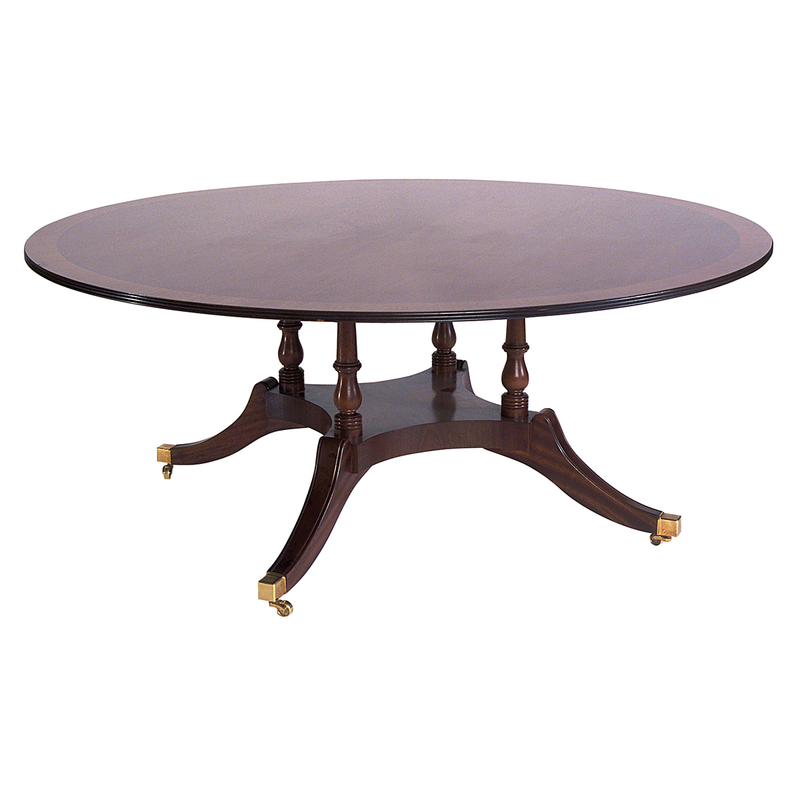 This table is hand made in England by skilled craftsman. 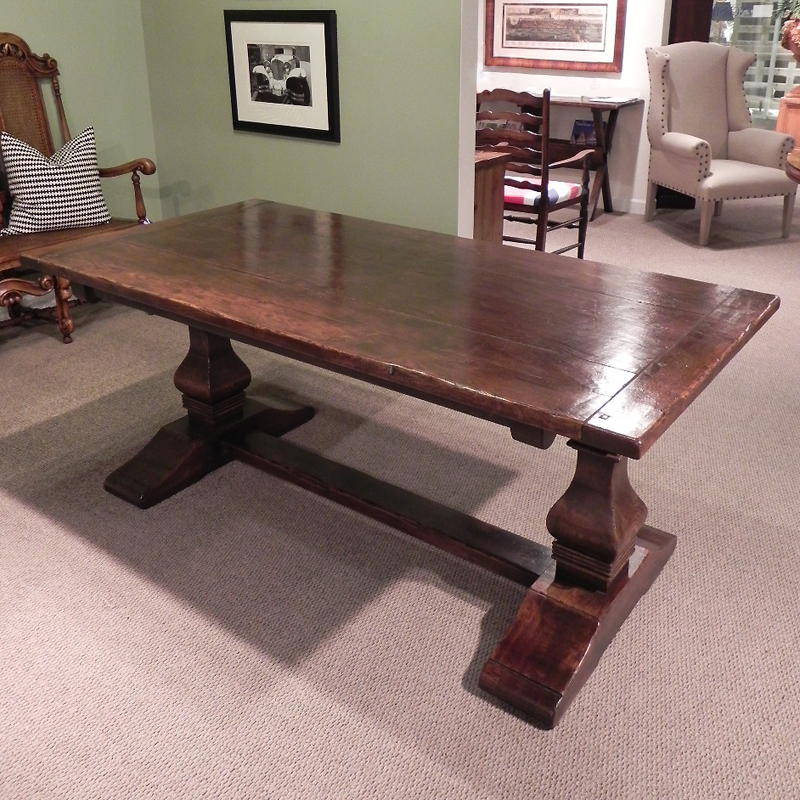 Antique oak finish 6' X 3'6" tapered leg table with 2 drawers & breadboard ends. 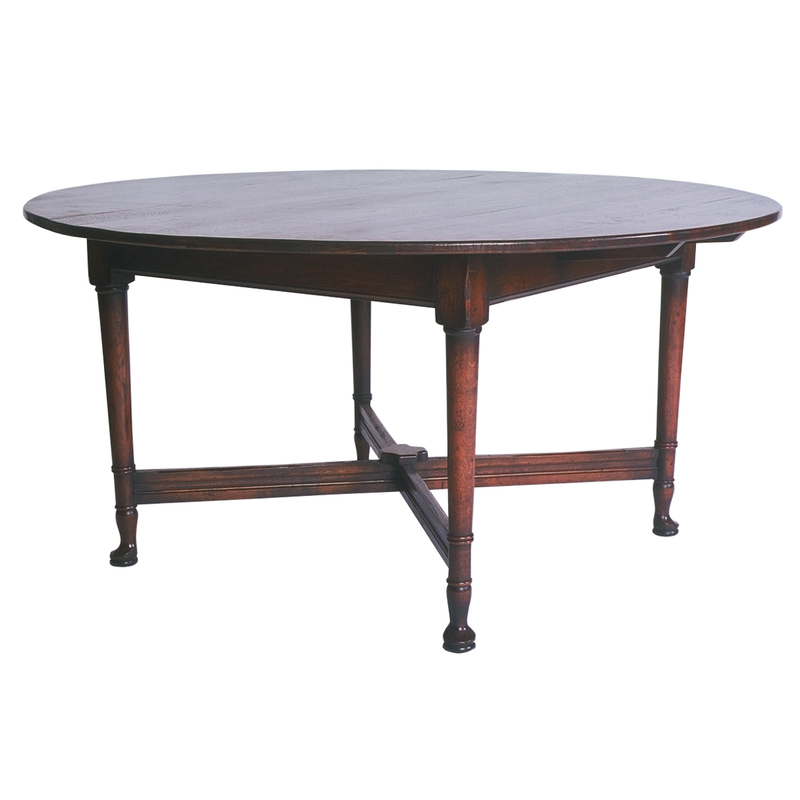 This table is hand made in England by skilled craftsman.